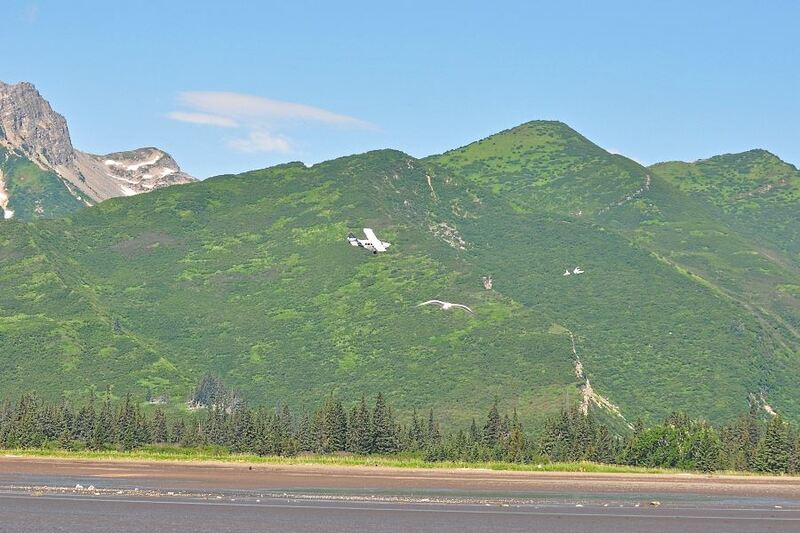 On a perfect summer morning, we left Anchorage and flew southwest along the coast of Cook Inlet in a five-passenger de Havilland Beaver. 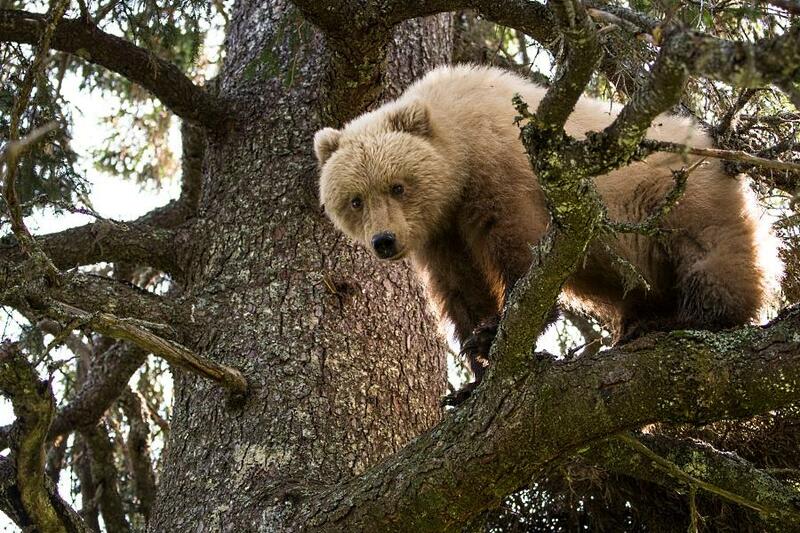 Our plane was allegedly built the same year I was born, not a particularly comforting thought. 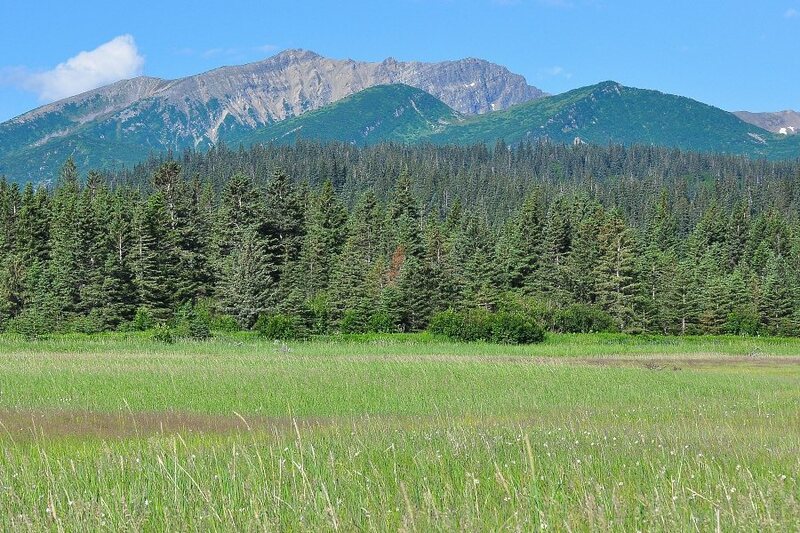 Within minutes of takeoff, I was struck by the beauty and wonder of Alaska -- blue sky and water, green meadows, ancient forests and white-capped mountains. 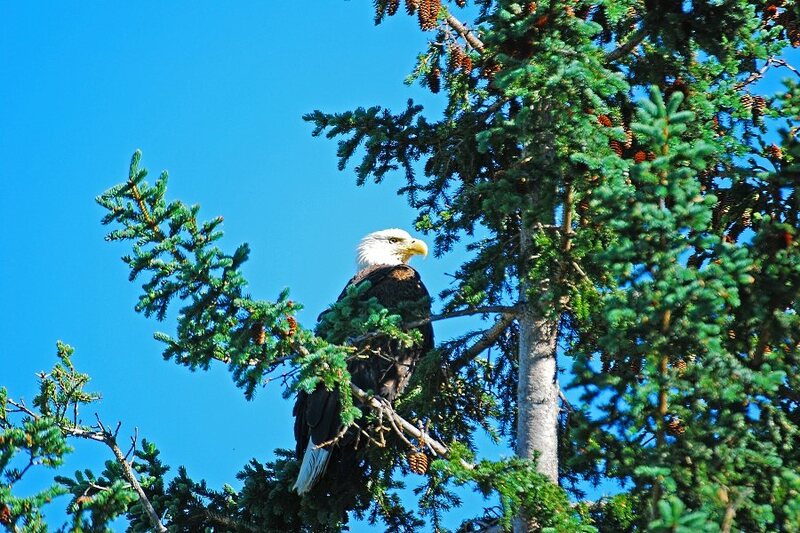 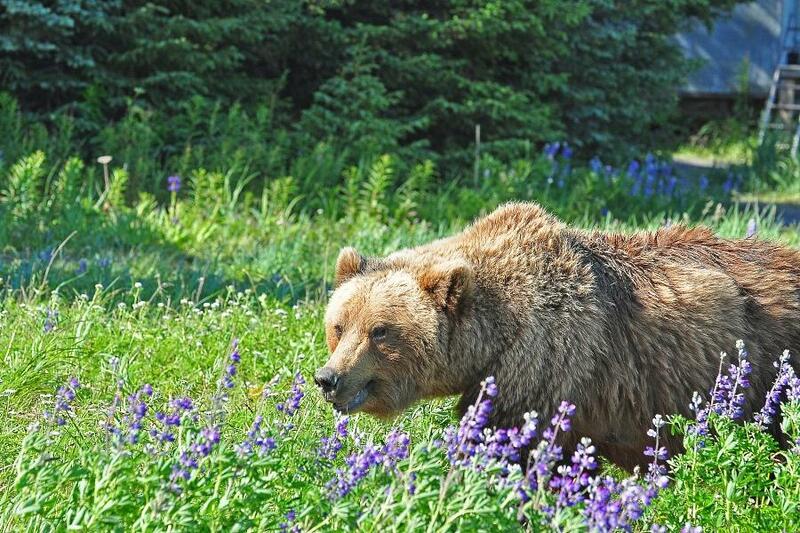 With vast areas still undisturbed by modern man, Alaska is nature at its very best. 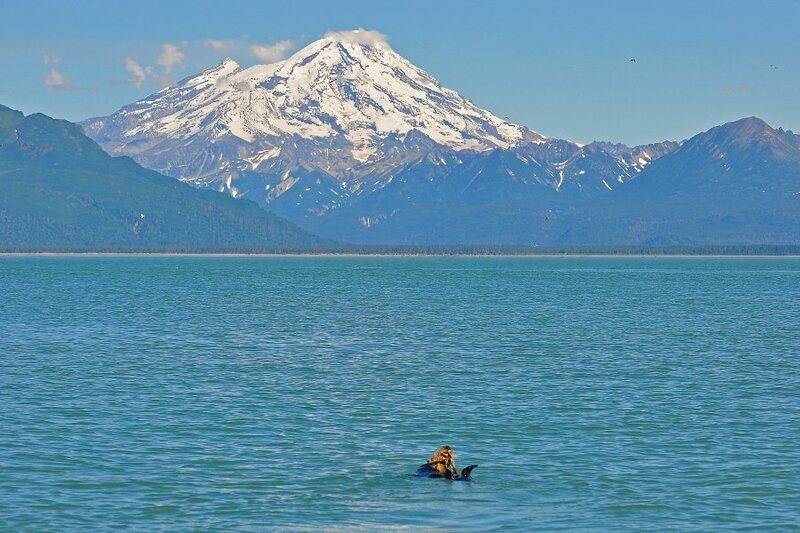 I sat beside the pilot and with his permission, opened my window to take photos of two active volcanoes, Mount Redoubt and Mount Iliamna, as we passed. 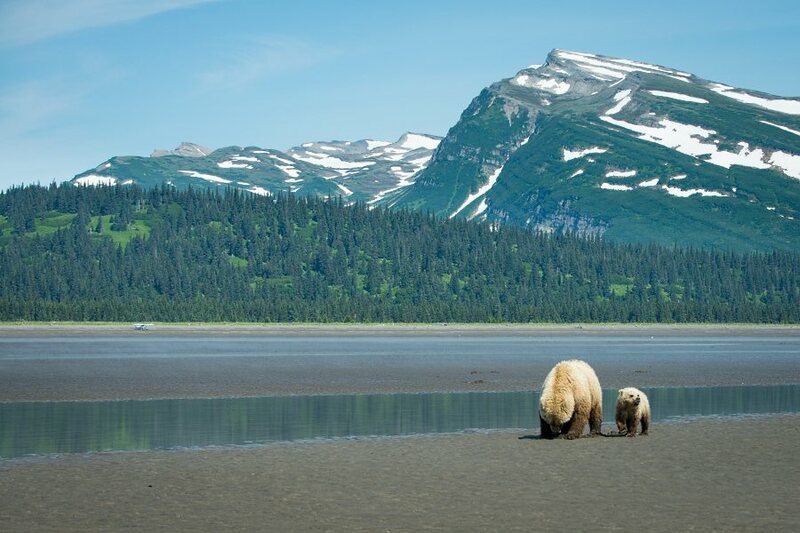 After an hour of flying, we landed on a sloping beach and climbed down onto the sand, where we were met by our hosts, David and Oliver Coray, father and son proprietors of Silver Salmon Creek Lodge (SSCL). 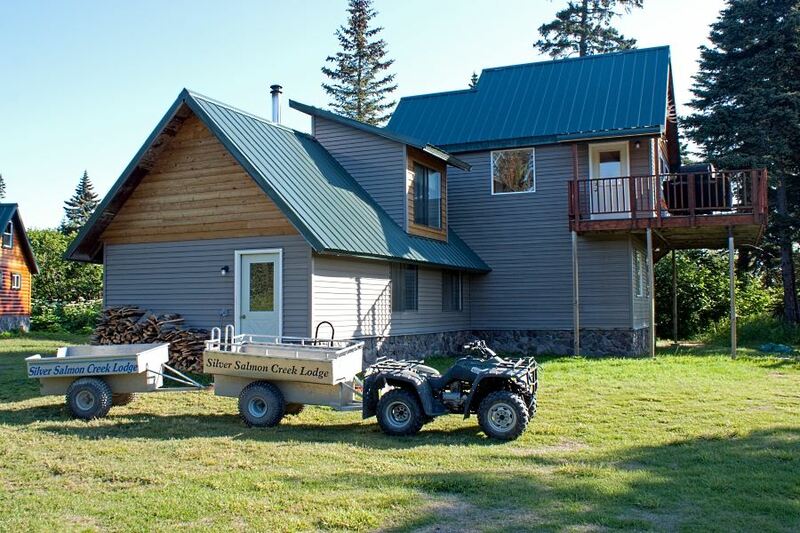 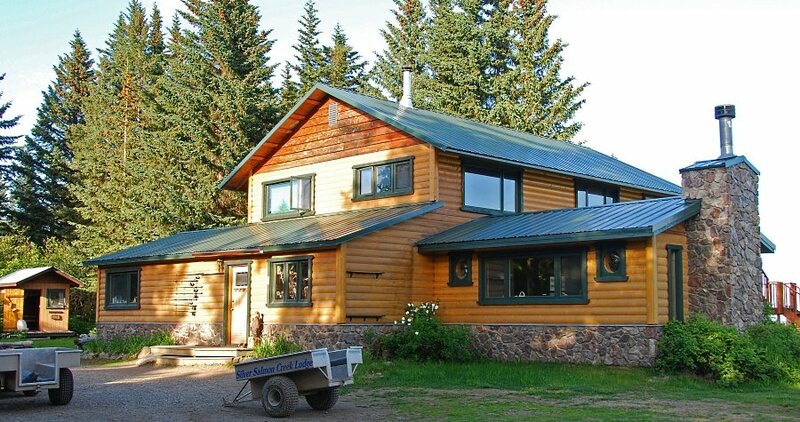 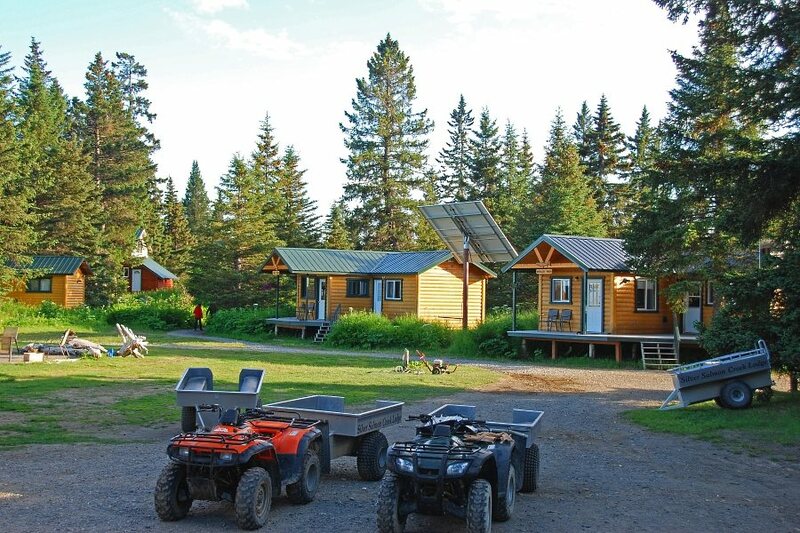 Twelve-year-old SSCL is a comfortable, well-run property that accommodates about 20 guests in five cabins and the main lodge. 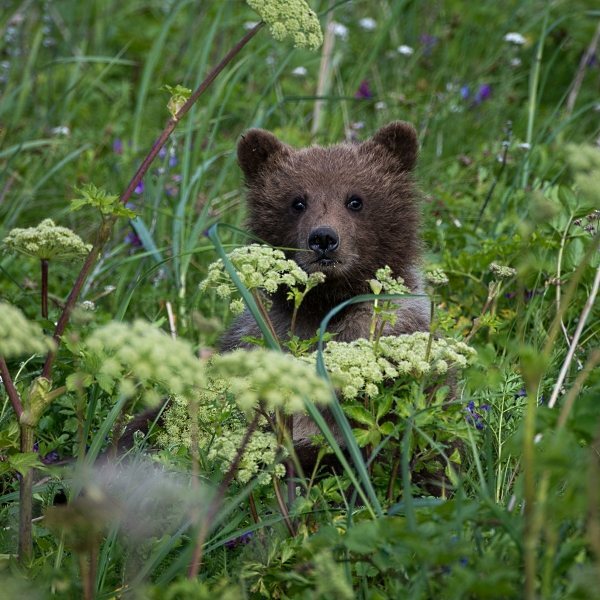 The lodge specializes in up-close bear photography and attracts amateur and professional photographers from around the world. 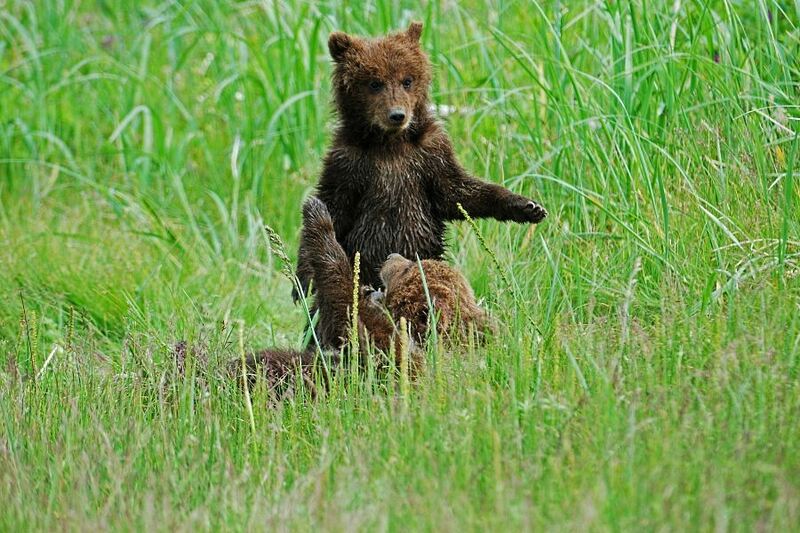 Cameras are not required, of course, and anyone who enjoys intimate encounters with wildlife is welcome. 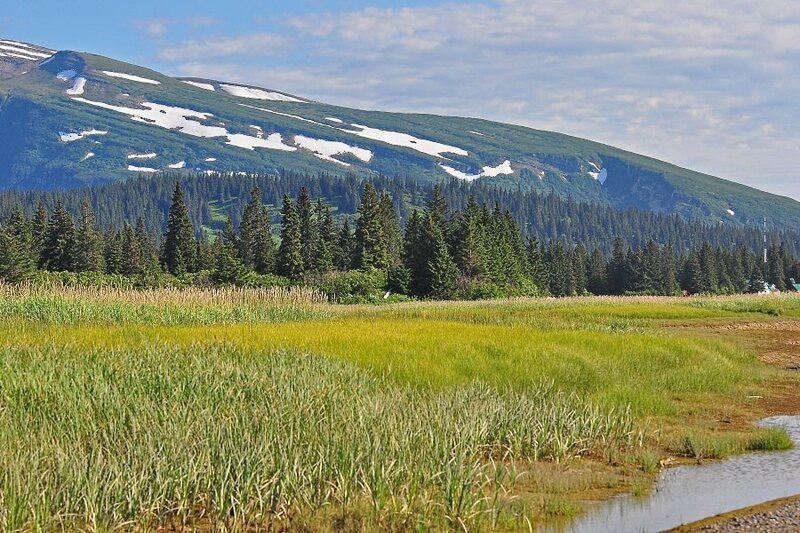 The place is accessible only by boat or bush plane. 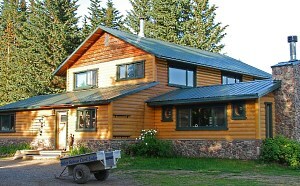 SSCL sits 200 yards back from the coast with nothing to block the view. 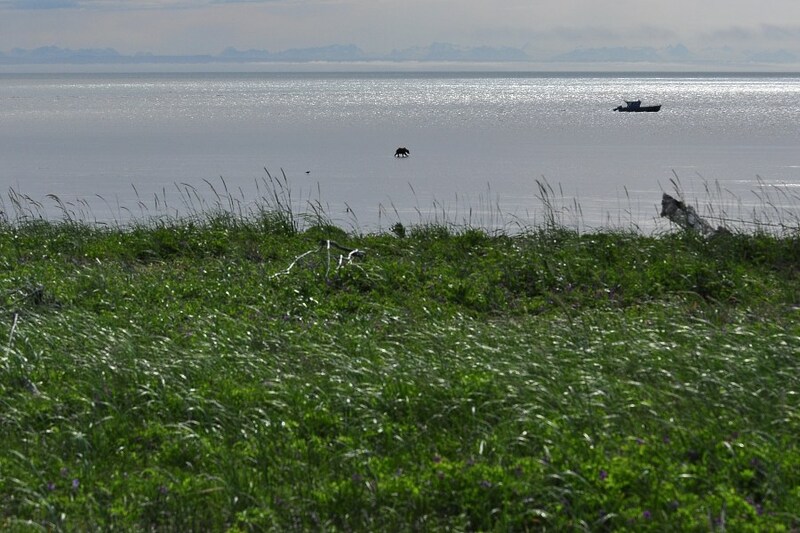 Cook Inlet is about 60 miles wide here, and on a clear day, you can see snow-covered mountains on the far side. 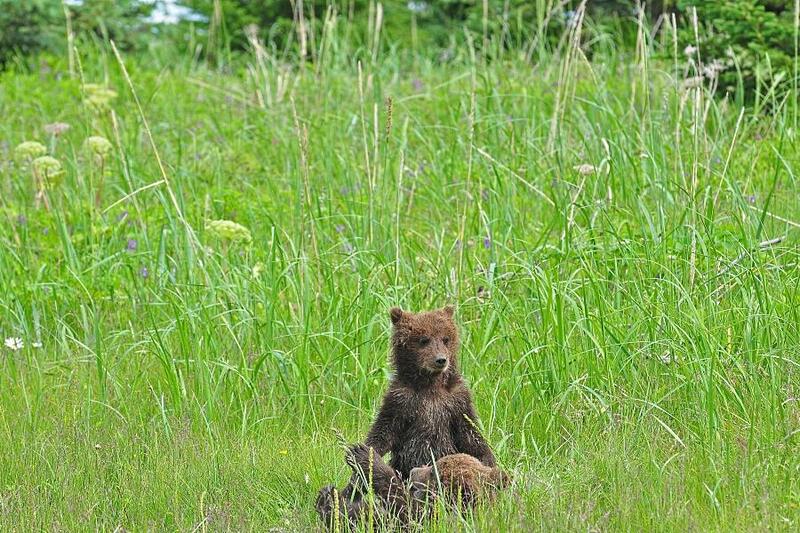 The daily routine consists of three hearty, family-style meals in the main lodge, plus hours of bear viewing in small groups on the shore or in the meadows, in the morning and afternoon. 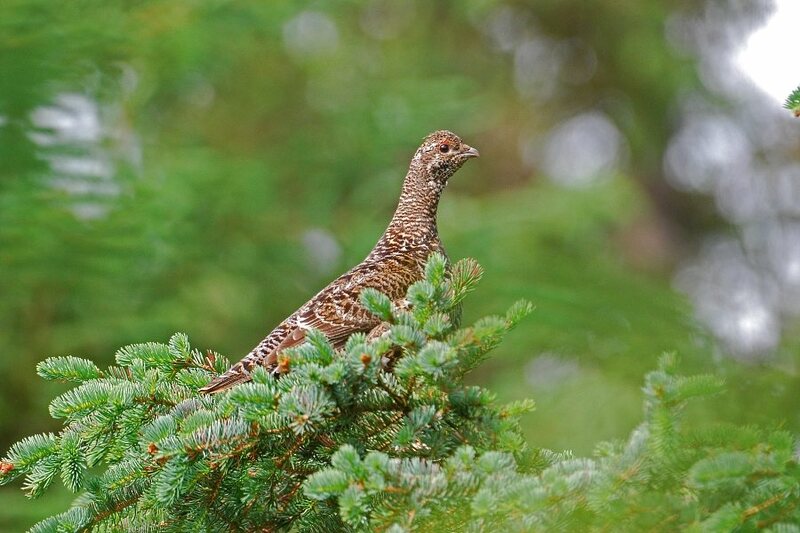 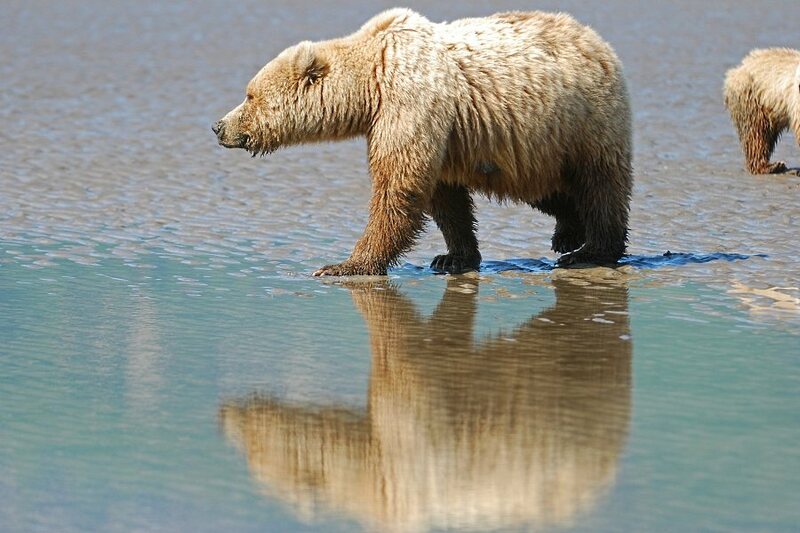 Guests who wish to do so can head out again after dinner as it is light 20 hours a day and the guides -- expert naturalists and photographers -- are up for anything. 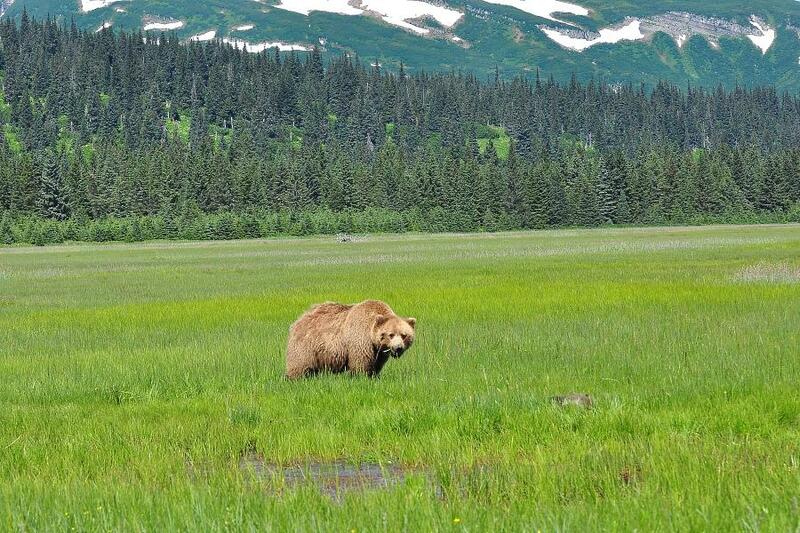 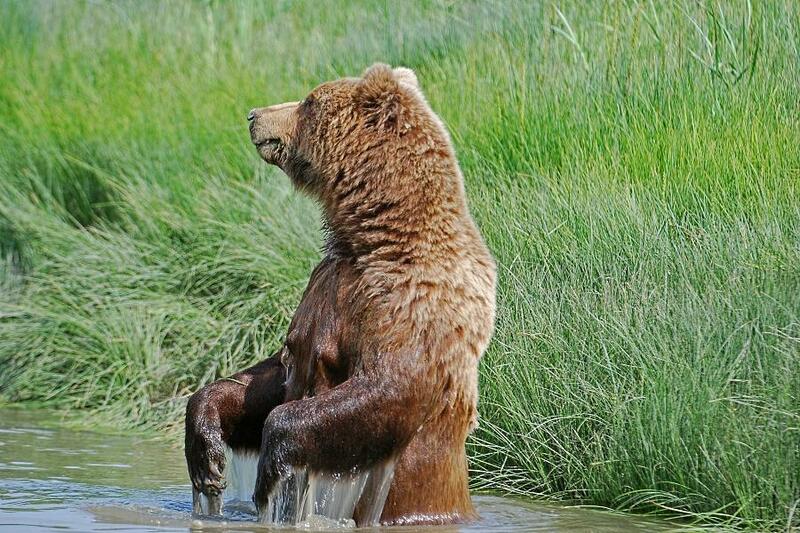 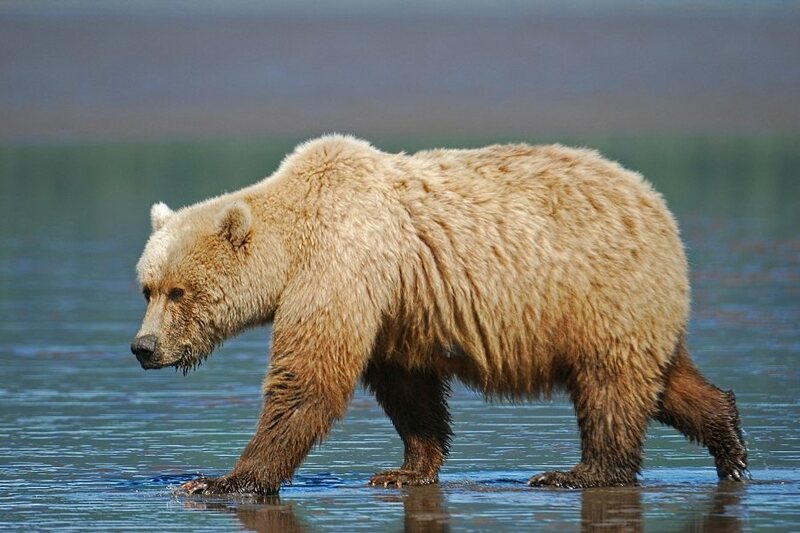 Brown bears are the second-largest species of bear and are almost as large as polar bears. 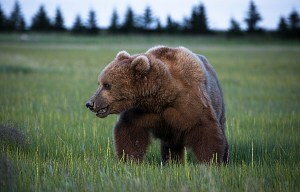 They can exceed nine feet in length and weigh more than 2,000 pounds. 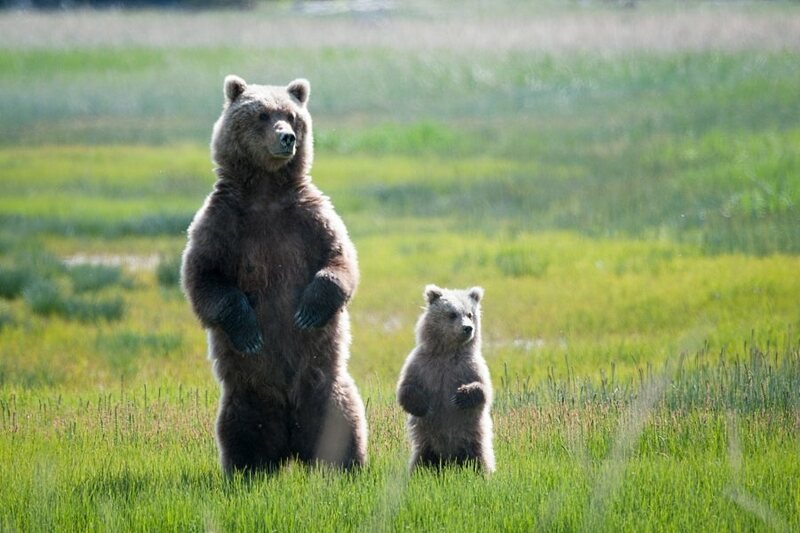 Adult males are up to 50% larger than females. 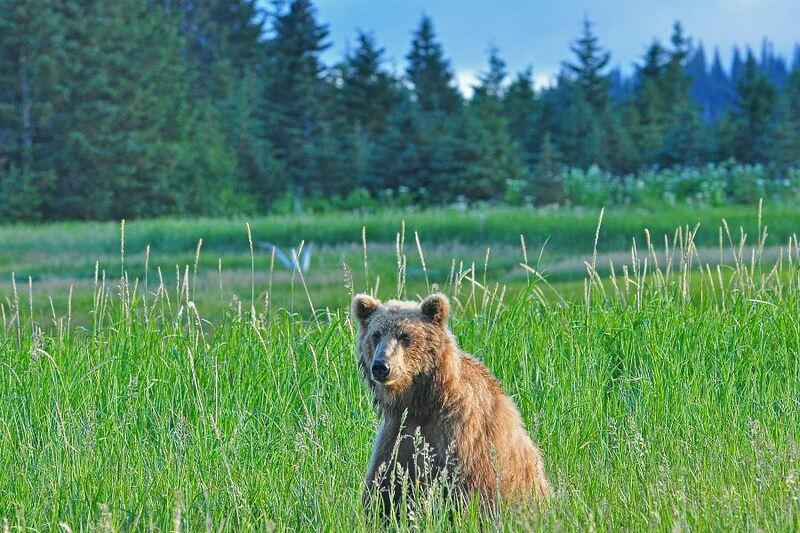 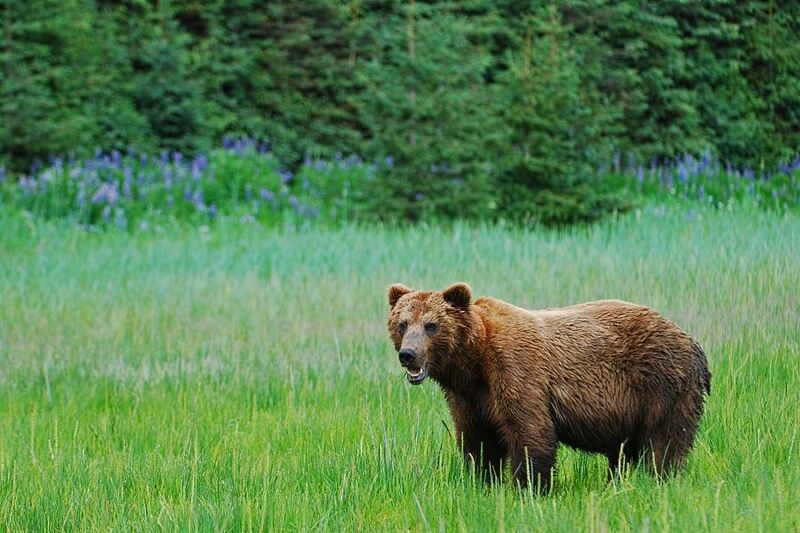 Infrequent news account of attacks on hikers or campers sometimes give brown bears a bad rap, but unless they are starving or threatened -- states that also make humans dangerous -- they are not naturally aggressive toward people. 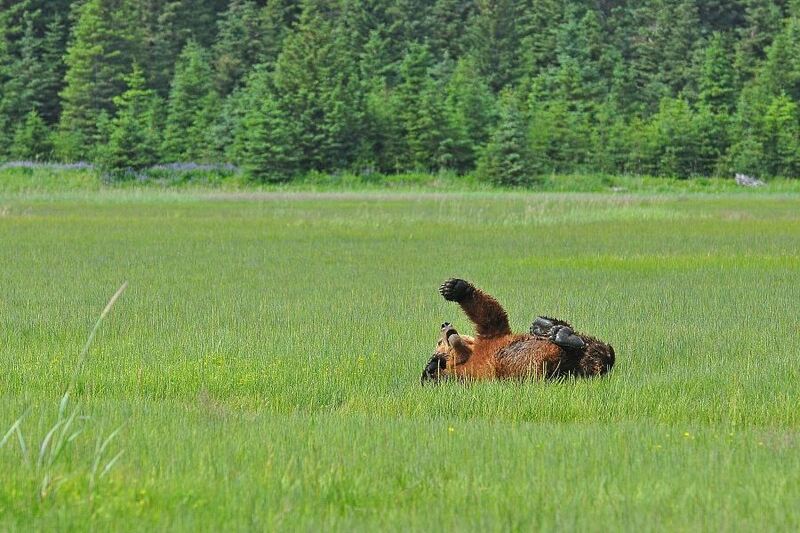 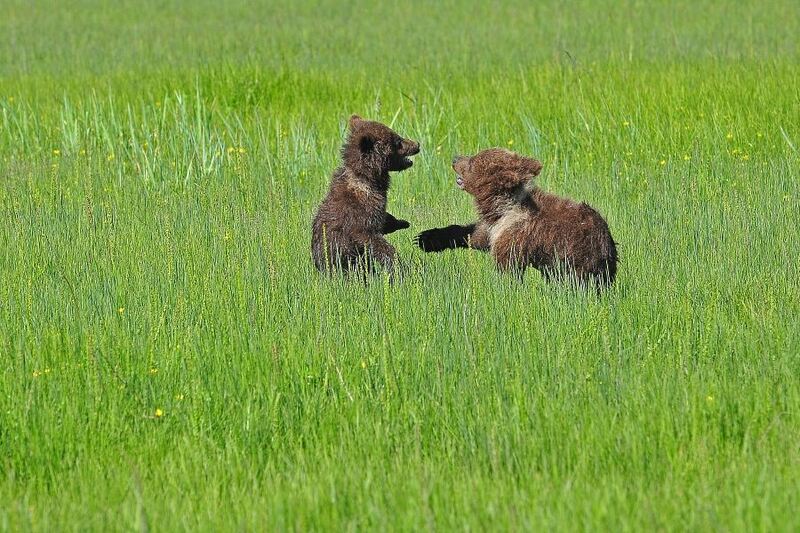 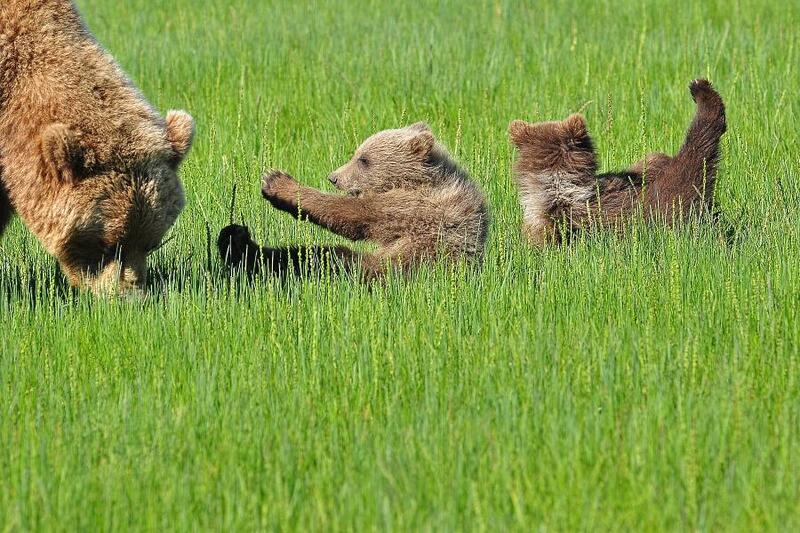 In our orientation, we learned how to behave around bears: No sudden moves, no loud noises, never run from a bear, never get between a mother and cub. 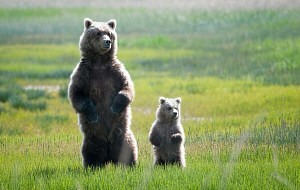 When sizing up humans, bears take into account the size of the entire group of people, so stay together. 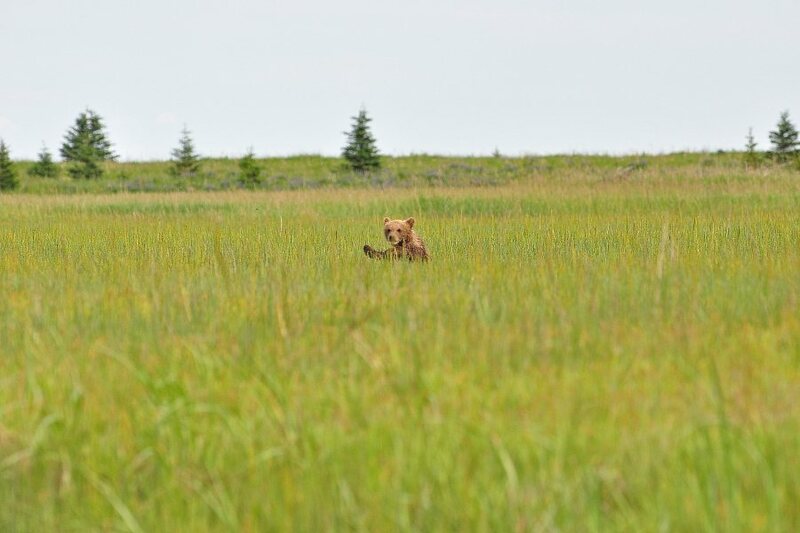 Throughout our visit, bears were easy to find. 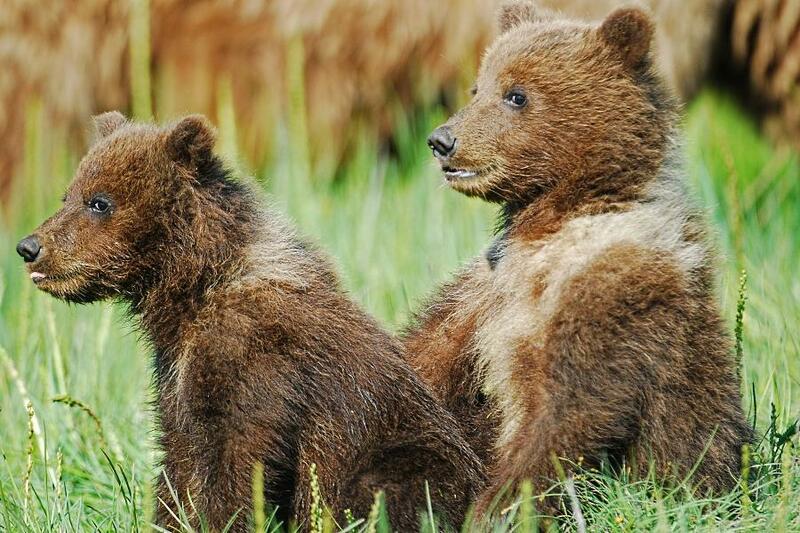 We saw big, solo males and females as well as mothers with one or two cubs. 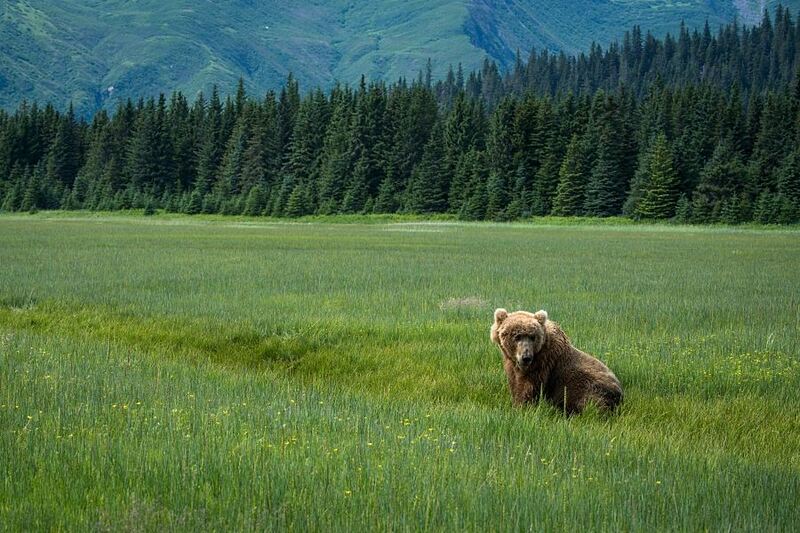 They wandered through the grounds of the lodge at all hours of the day and night, but all of our photography field trips were to the beach or the meadows. 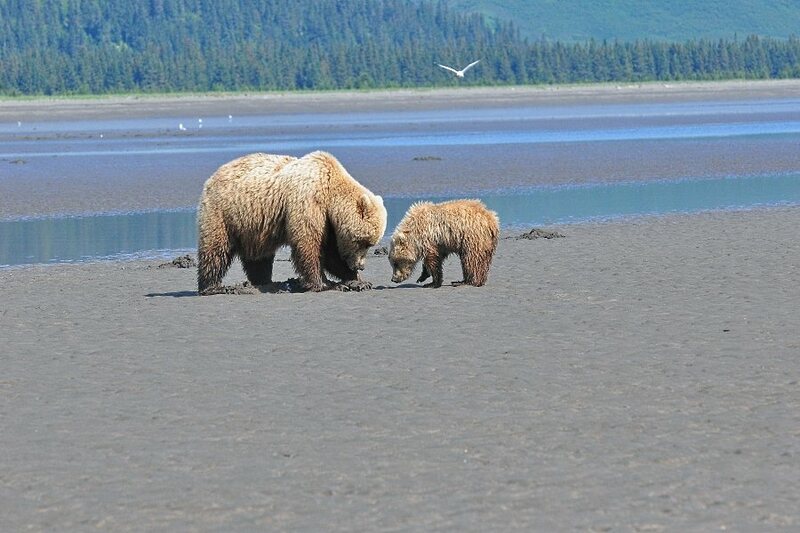 Tidal changes here are extreme, and low tide exposes more than a quarter-mile band of clam-rich sand for bears to search. 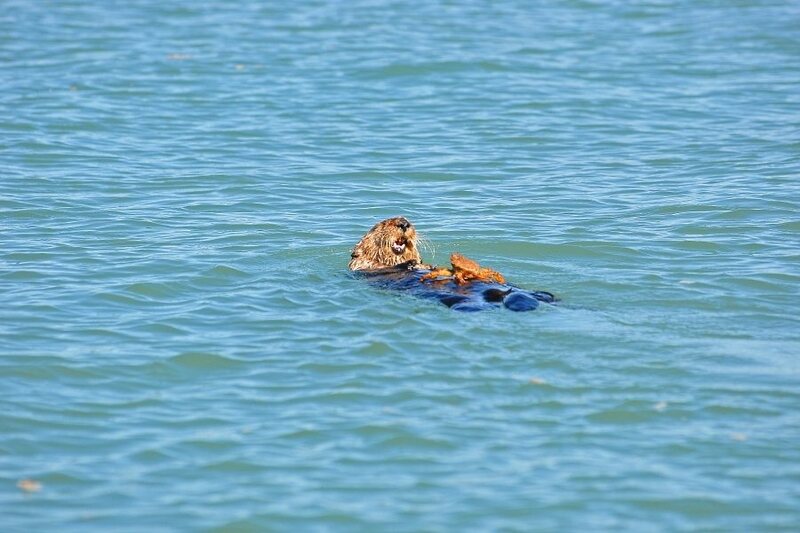 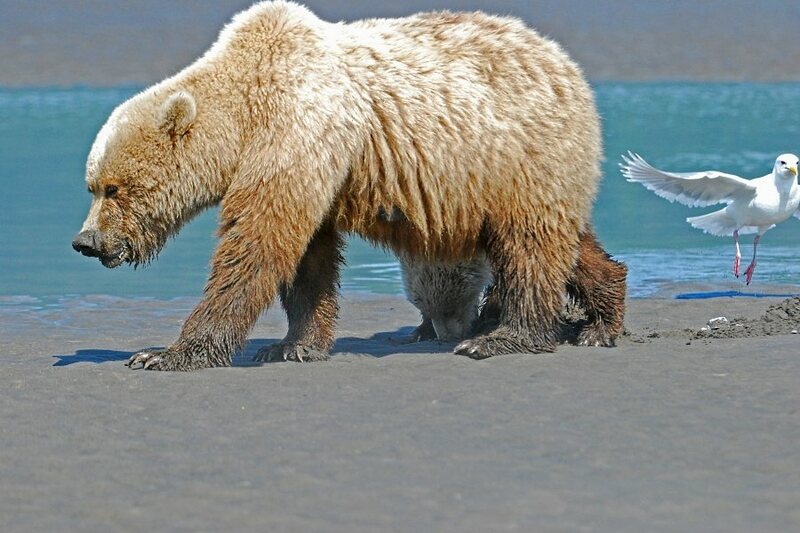 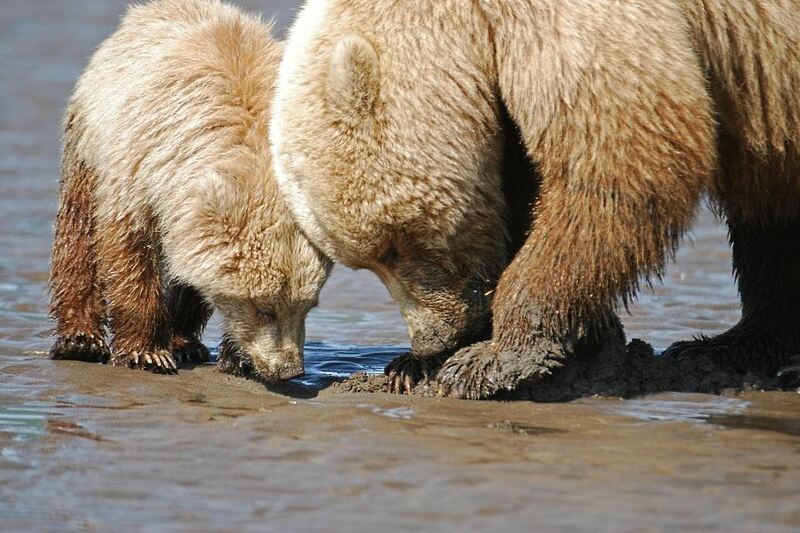 Burrowing clams sometimes leave a telltale hole in the sand, but experts believe bears locate clams using their sense of smell. 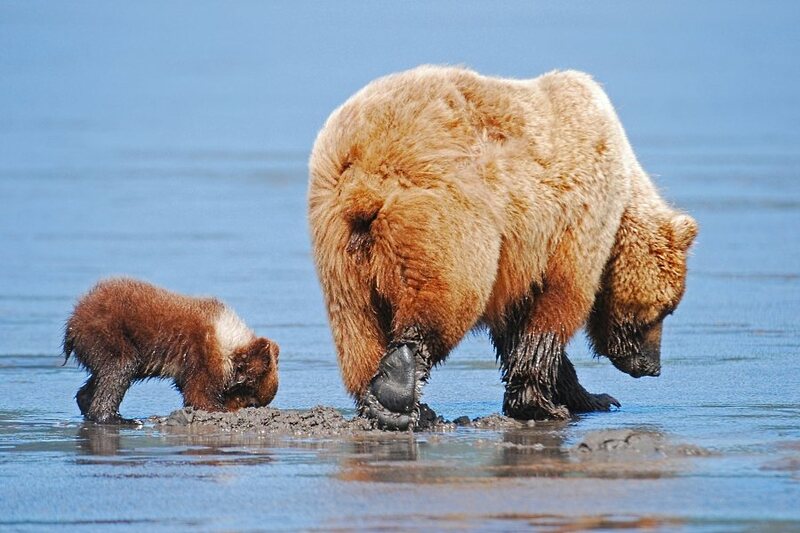 Three or four jabs from a big paw will unearth a clam, and a single swipe from the same paw will open it. 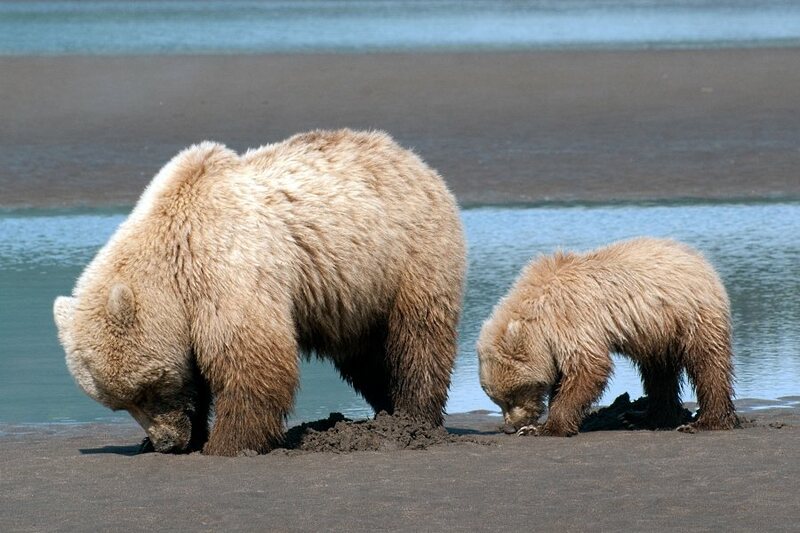 At low tide, there were almost always bears digging in the sand for razor clams, and at high tide, when the clams were not accessible, they grazed on sedge grass in the meadows. 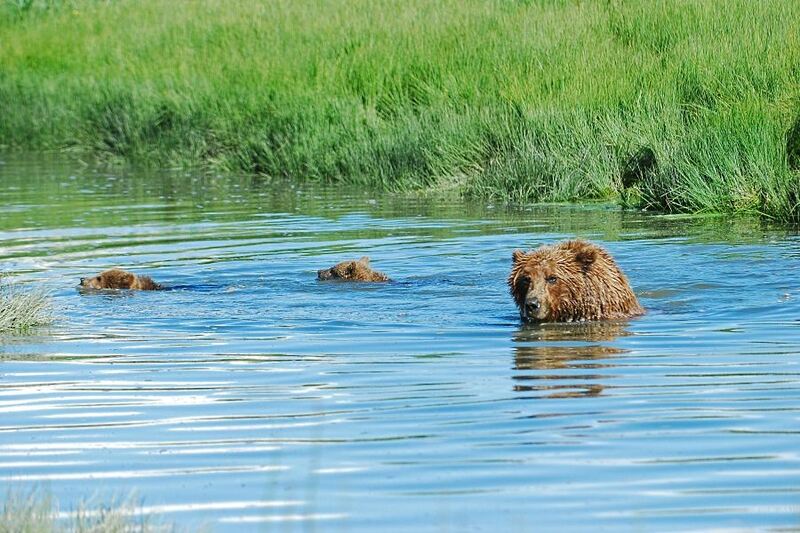 In August and early September, salmon return to their native streams in this area, and the bears -- and photographers -- congregate there. 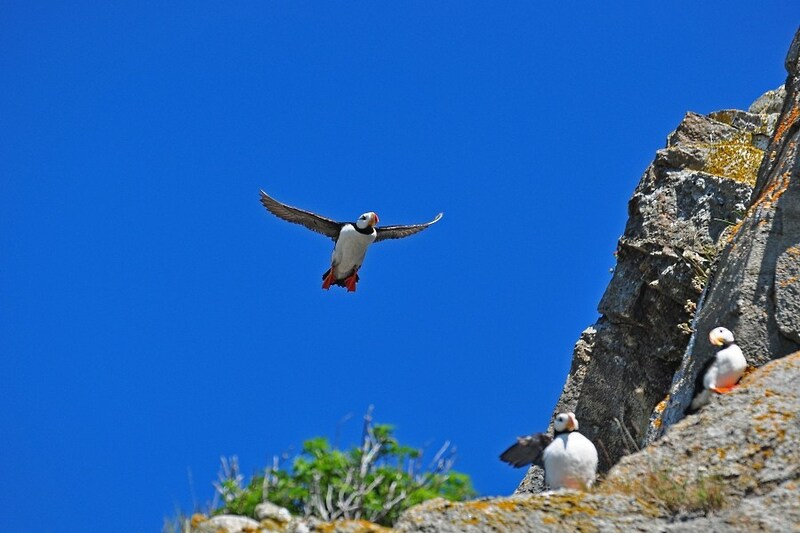 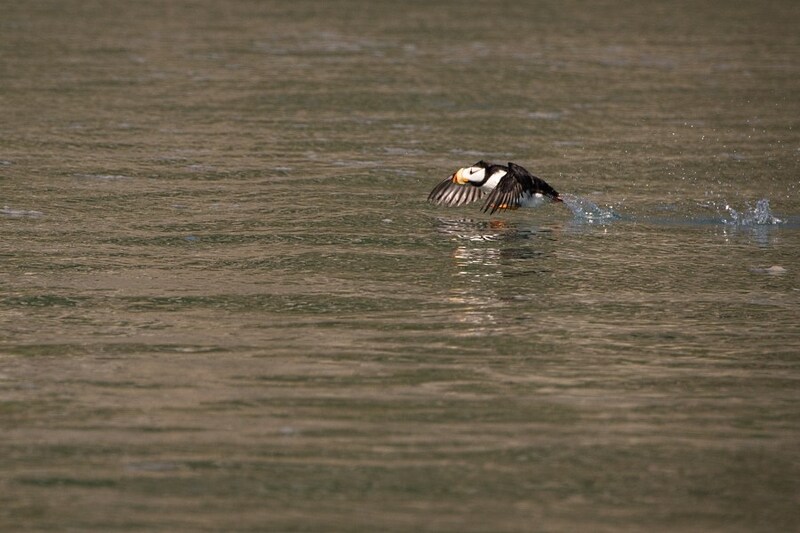 On the third morning of our visit, we took the lodge's 29-foot charter boat to a nearby island, where we saw horned and tufted puffins, common murres, an otter playing with a captured crab and more. 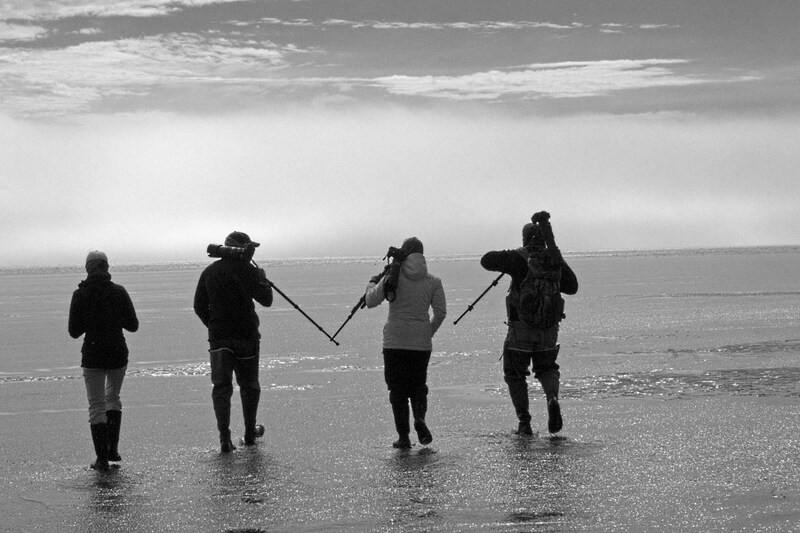 That afternoon, we took the same boat 20 miles offshore to fish for halibut, and our party of five caught our limit in an hour. 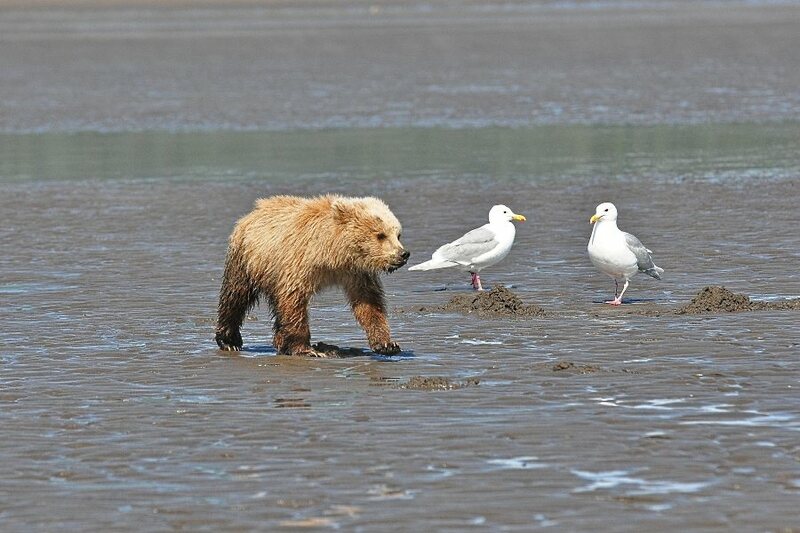 Our guides cleaned and froze our halibut, and we brought it home with us. 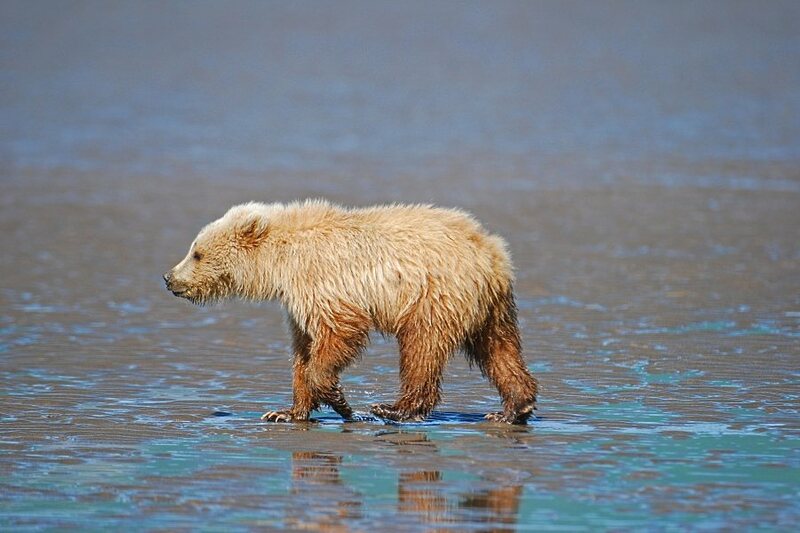 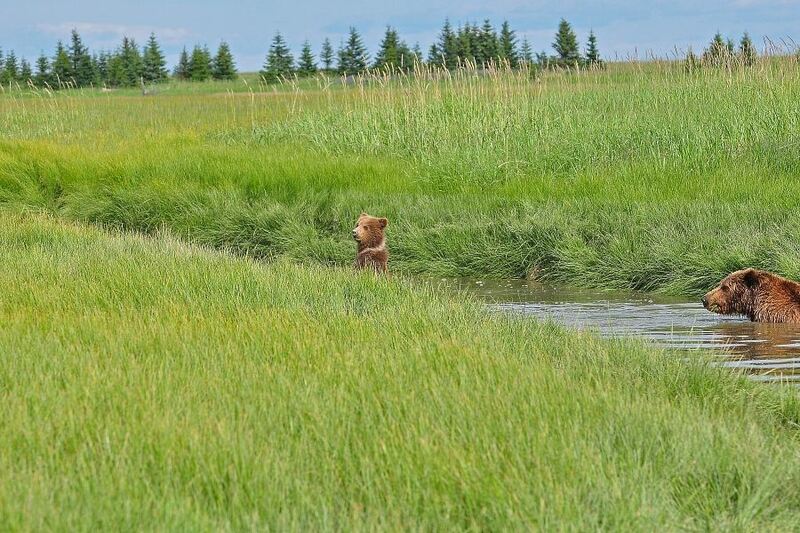 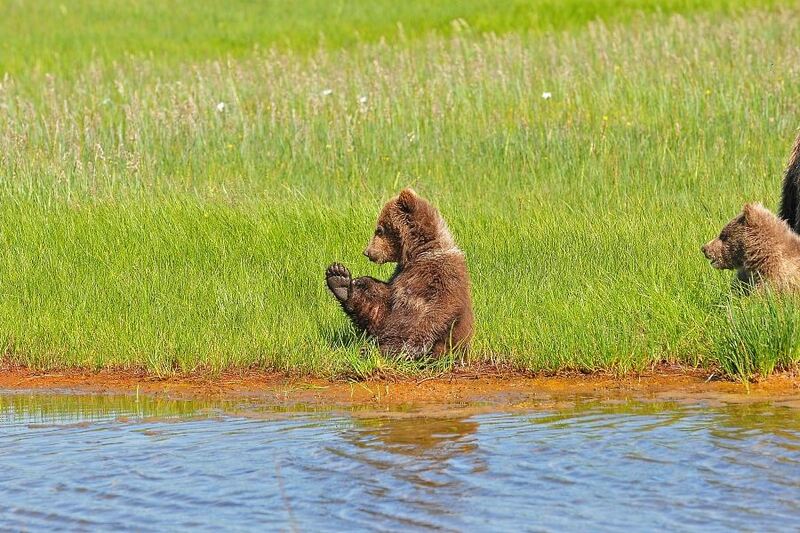 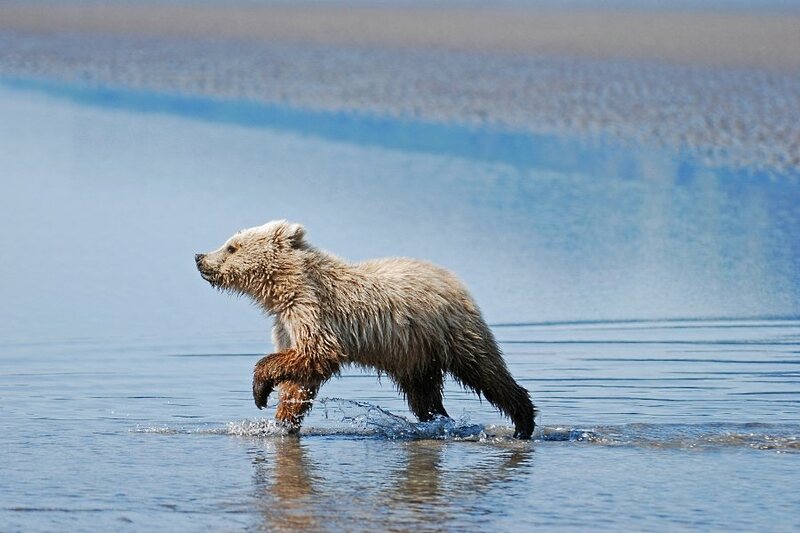 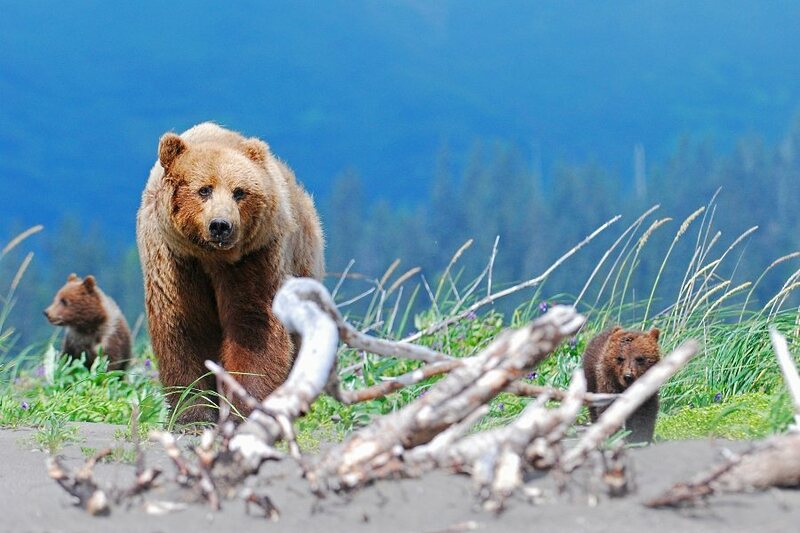 Bears are naturally solitary creatures and do not like to be around other bears, but the food supply along this stretch of coastline produces an uneasy concentration of these animals. 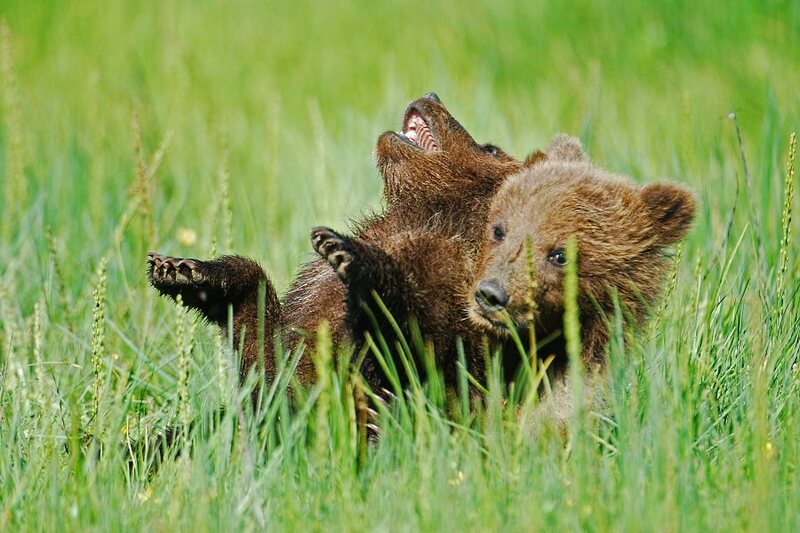 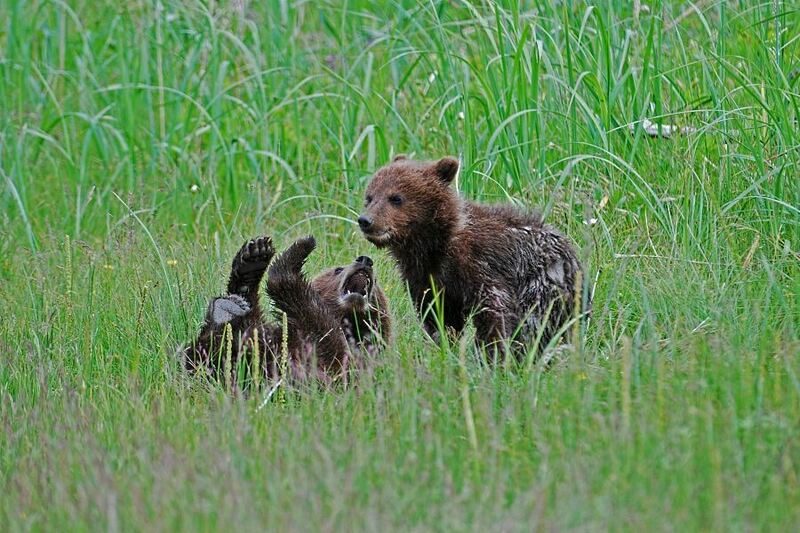 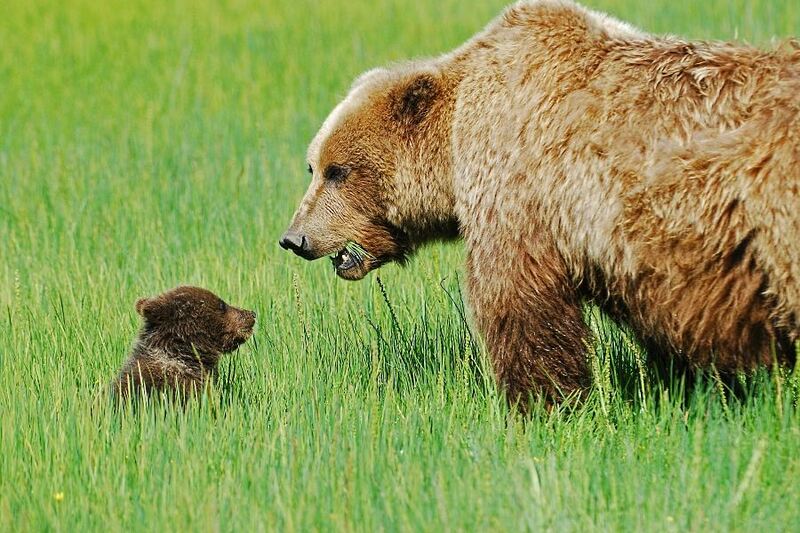 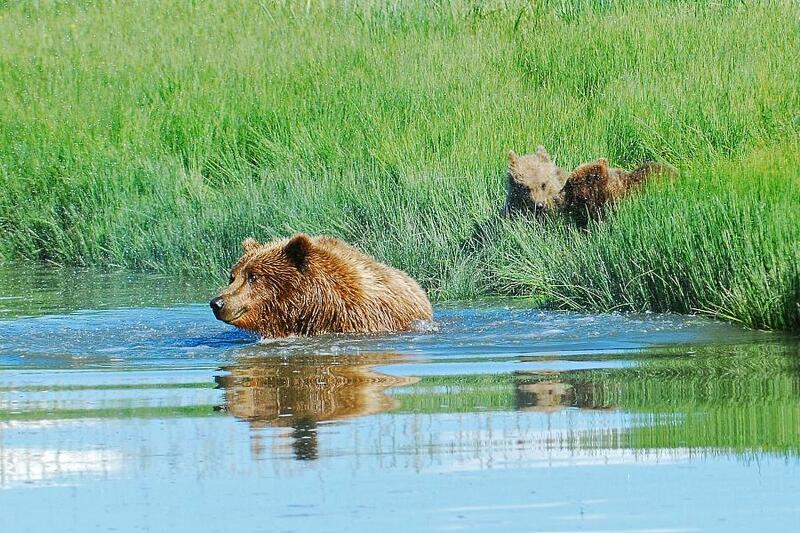 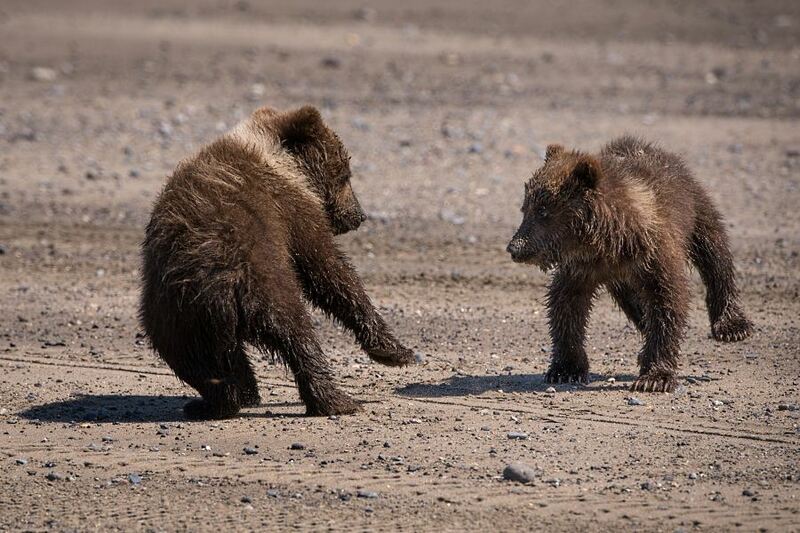 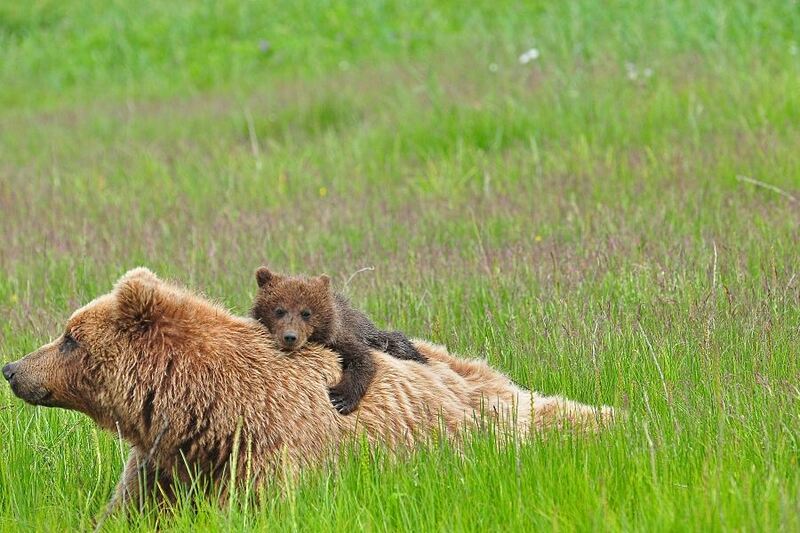 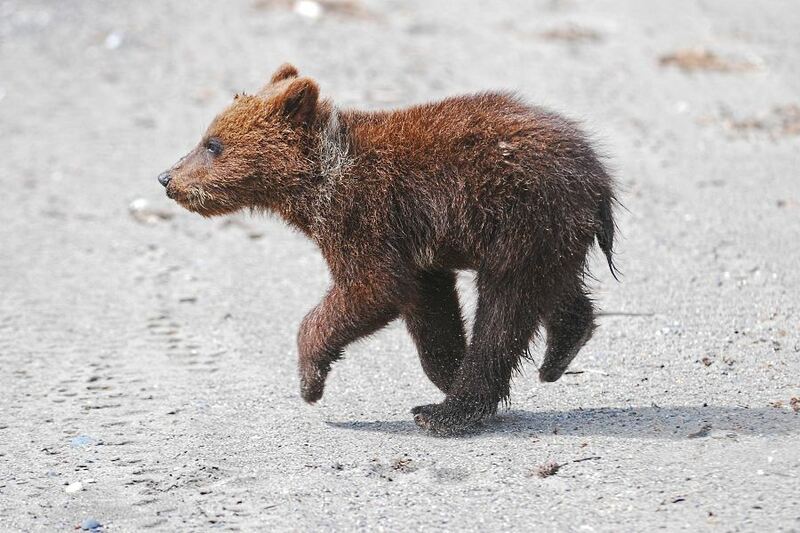 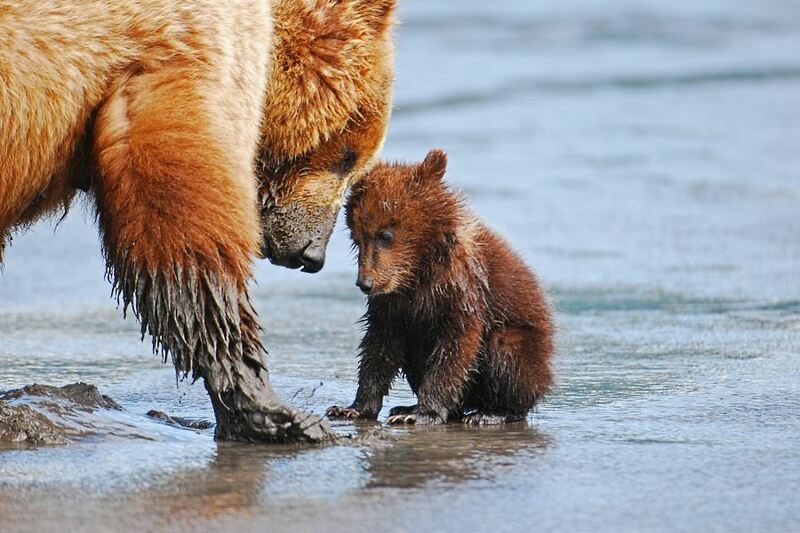 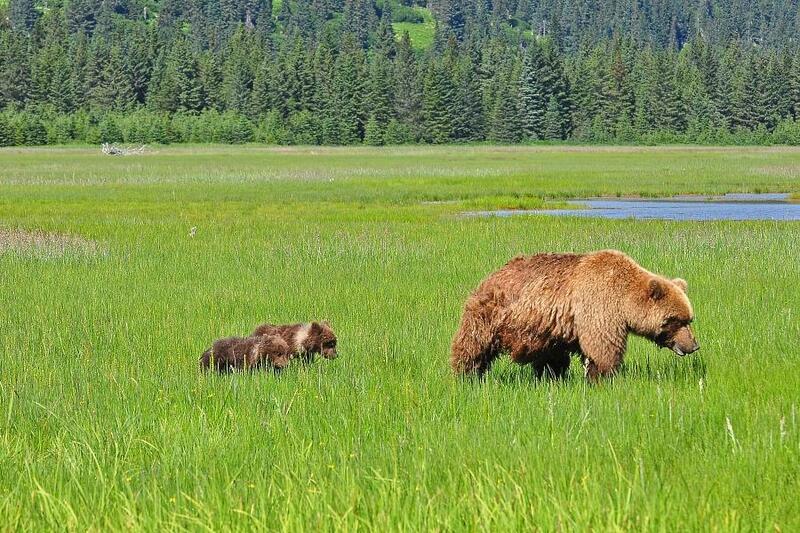 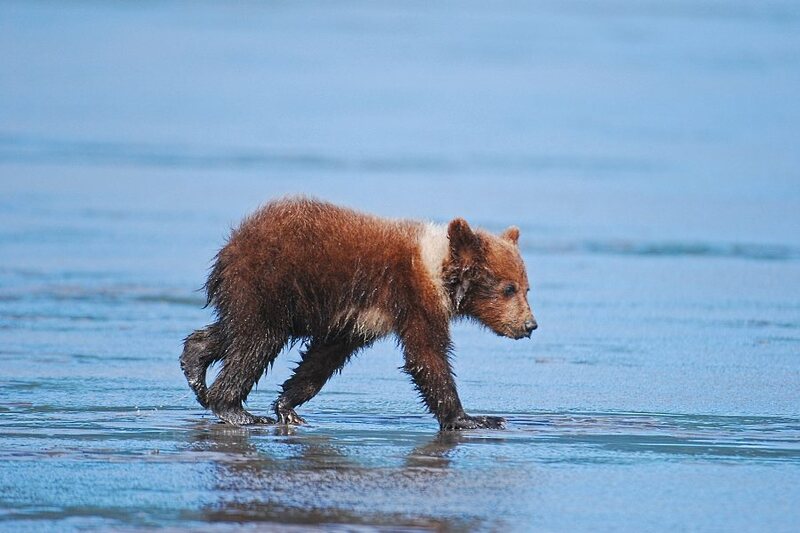 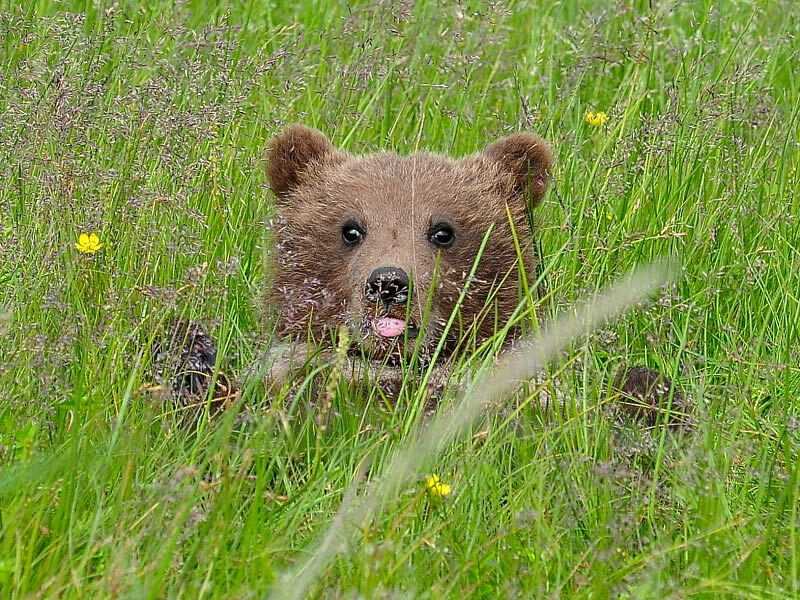 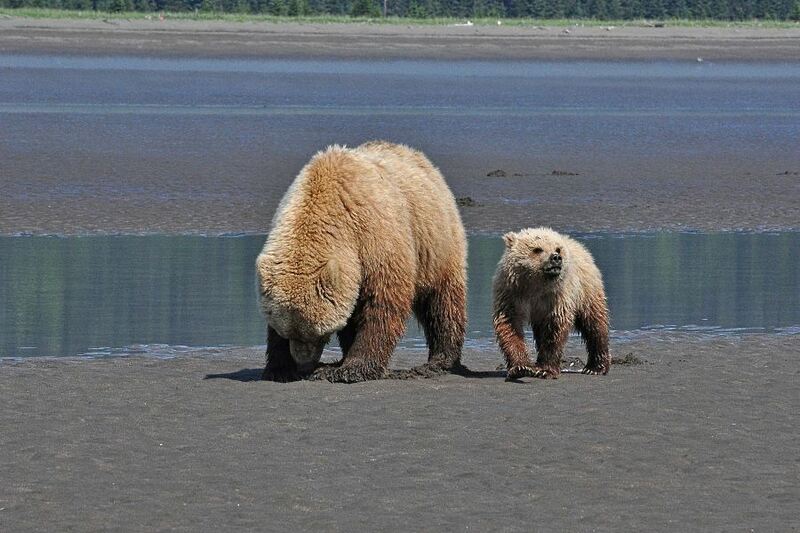 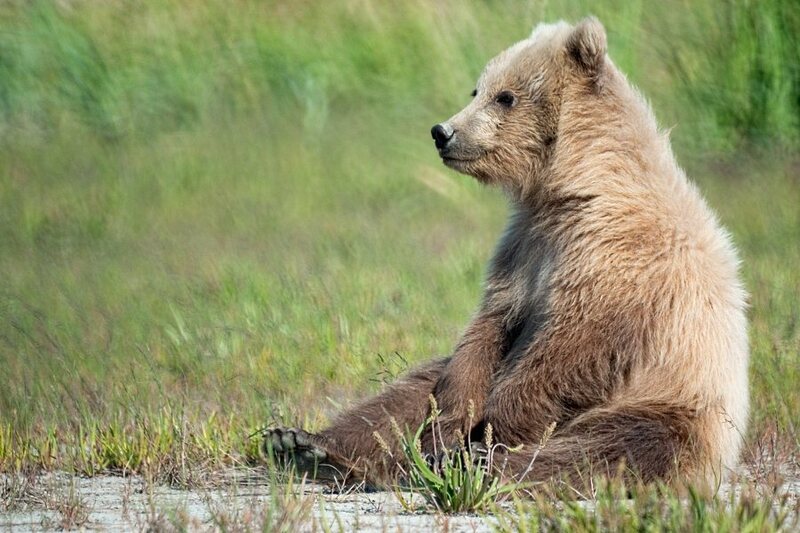 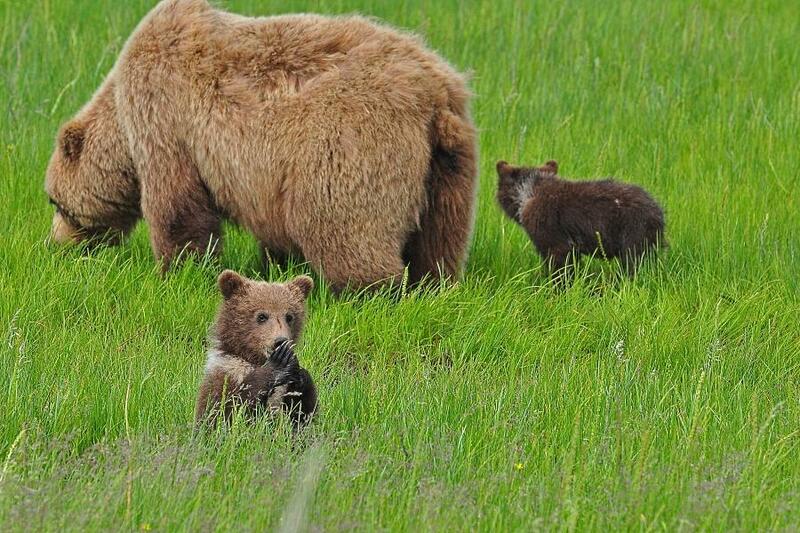 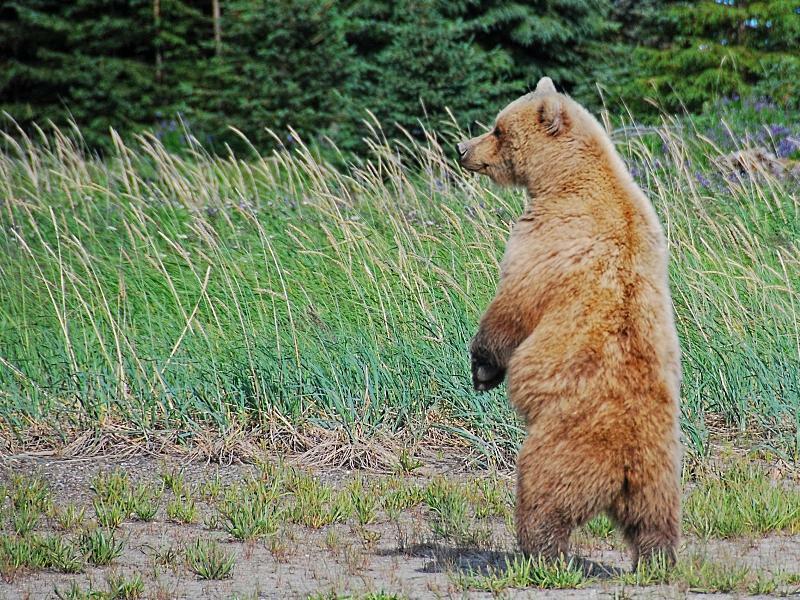 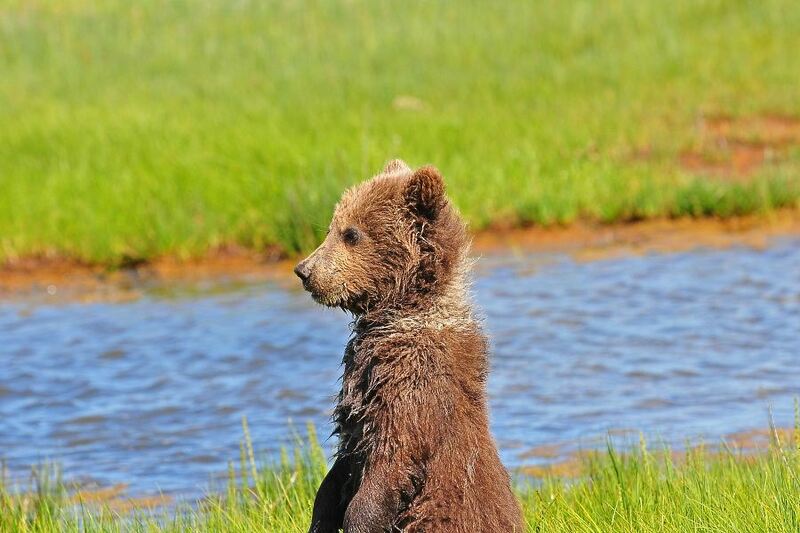 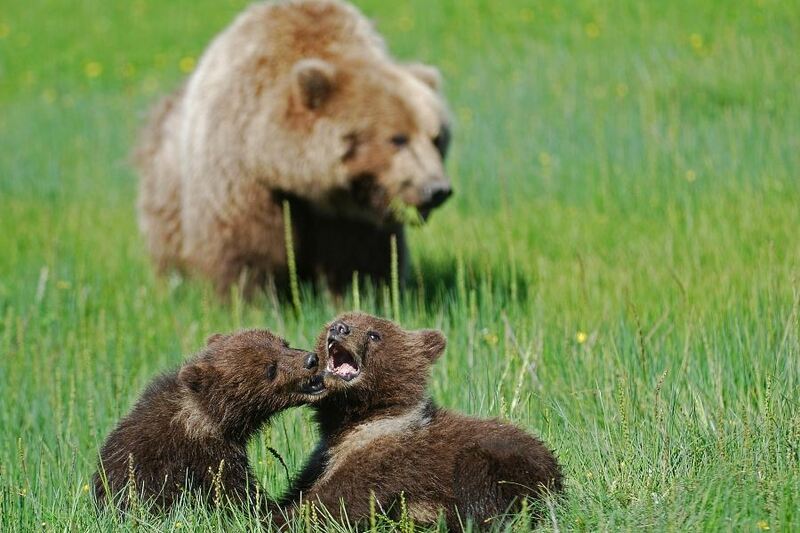 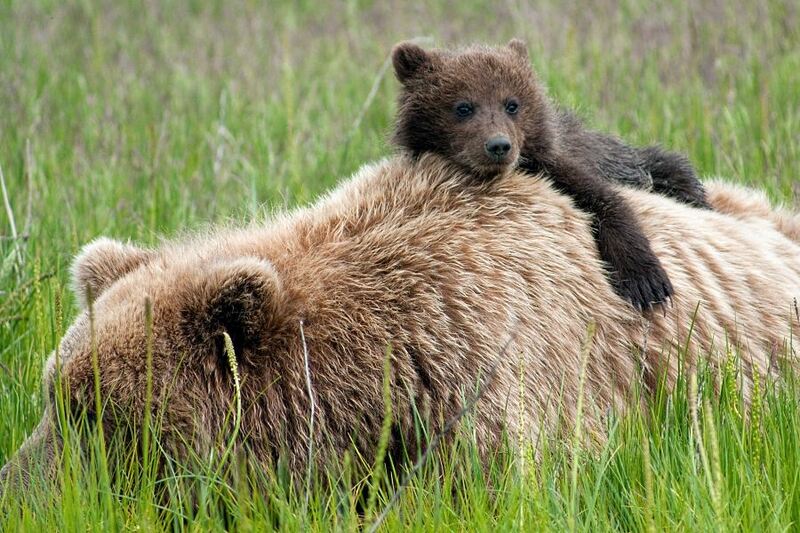 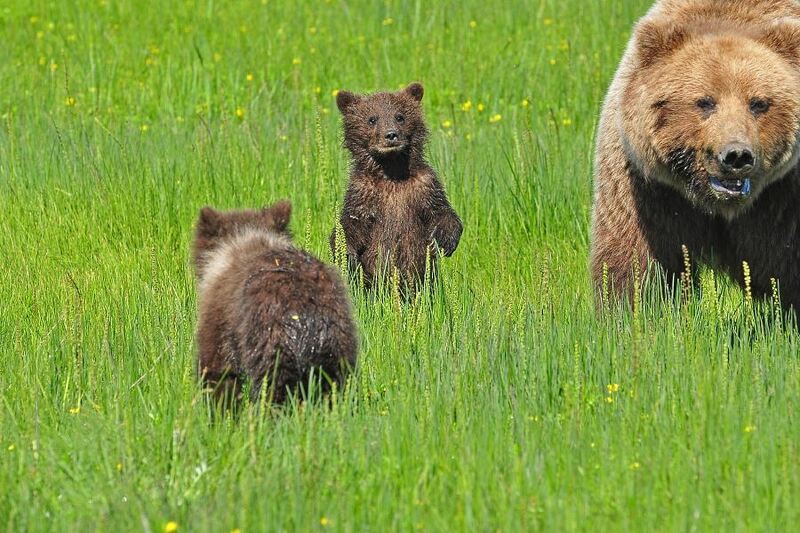 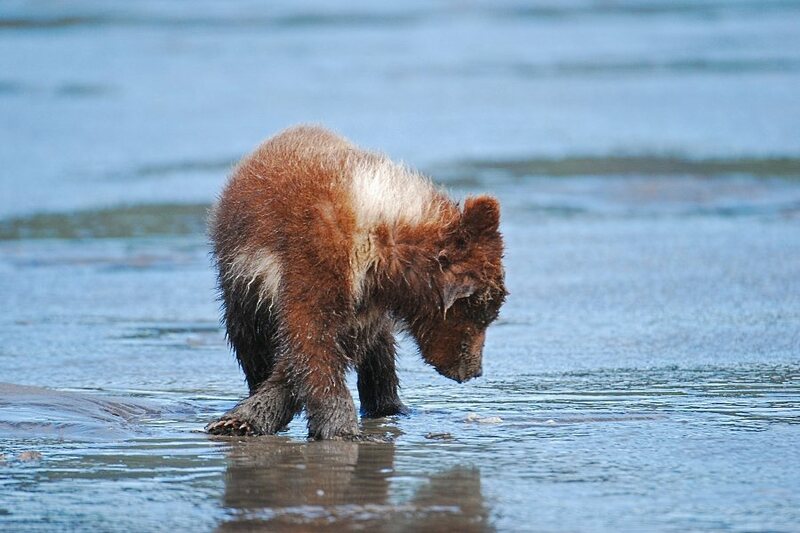 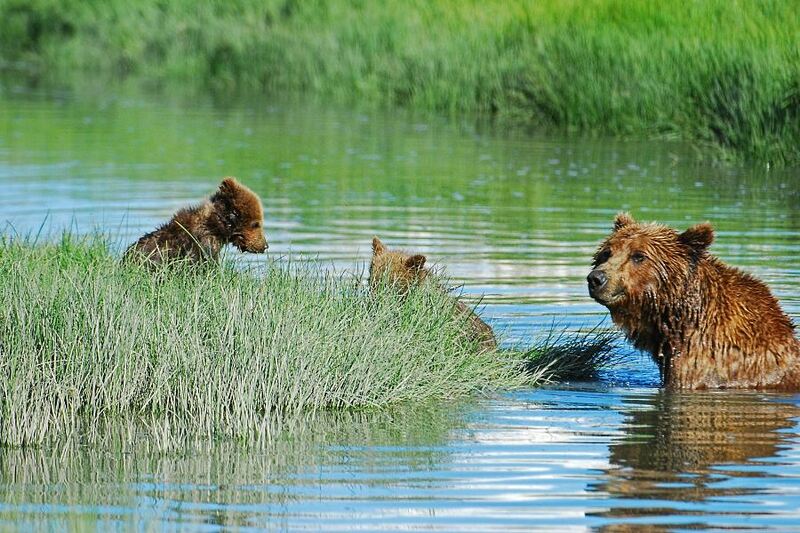 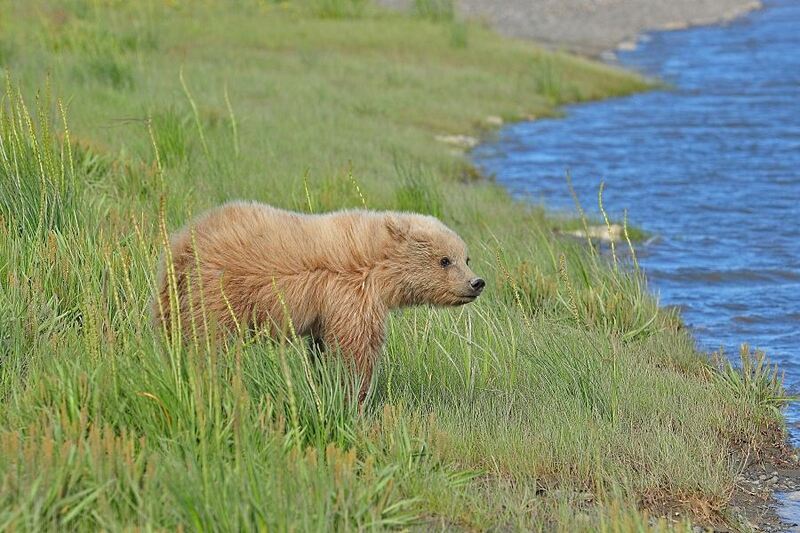 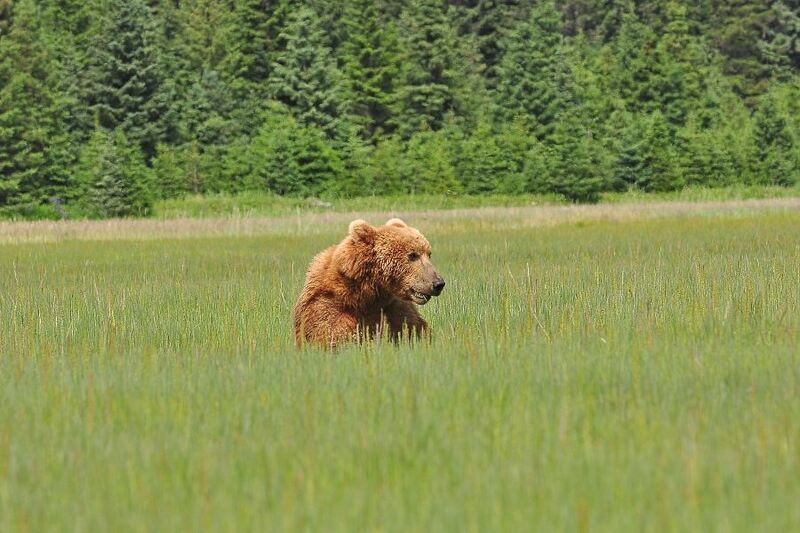 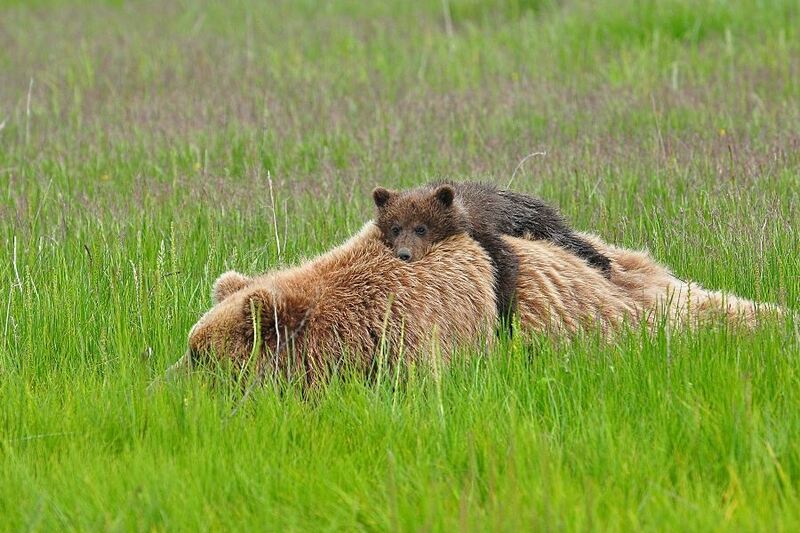 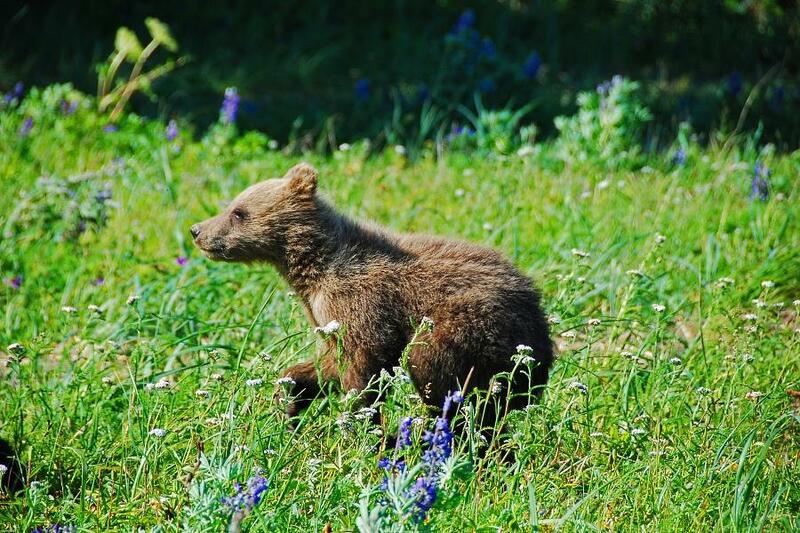 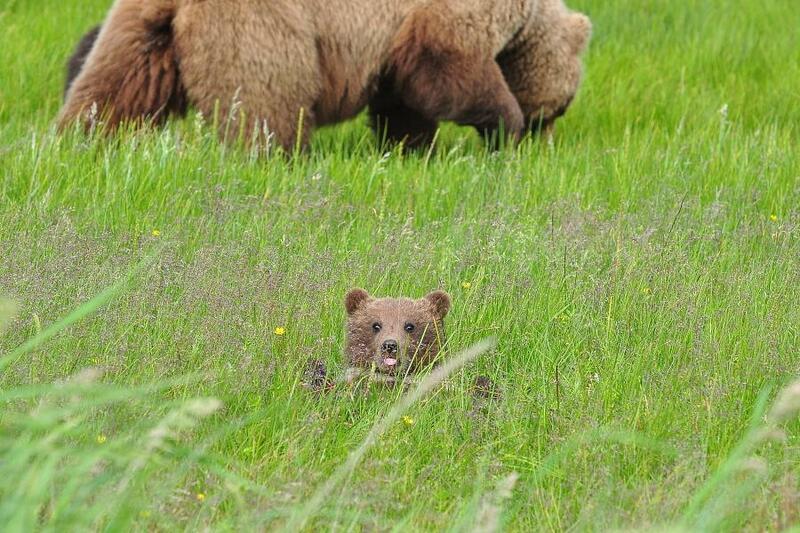 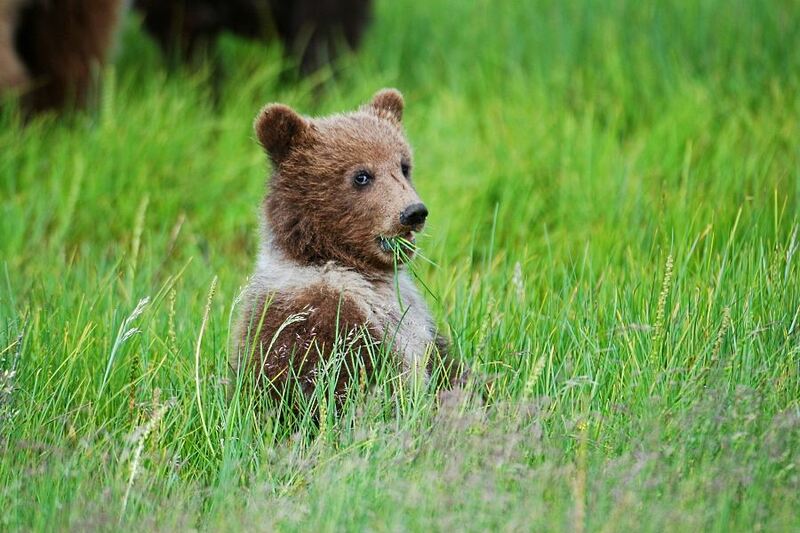 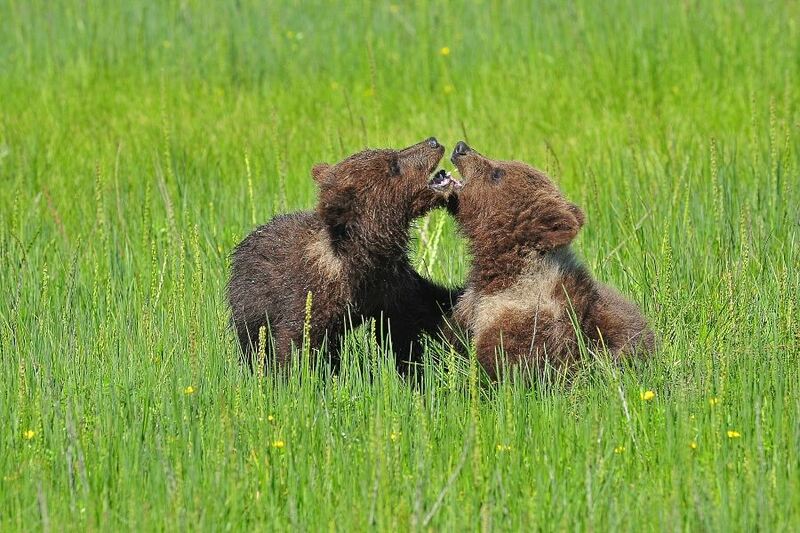 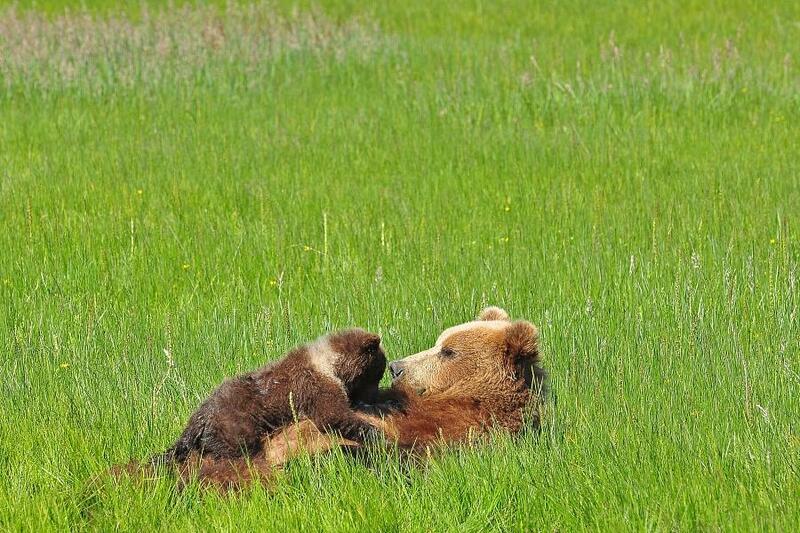 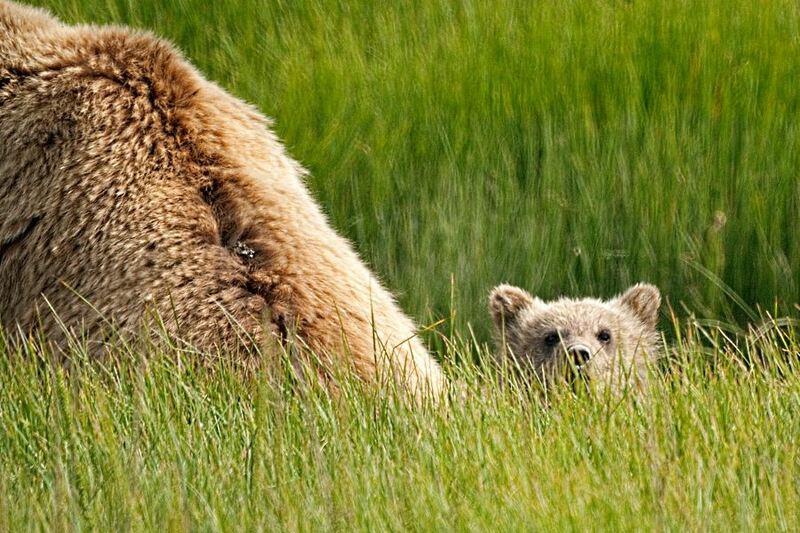 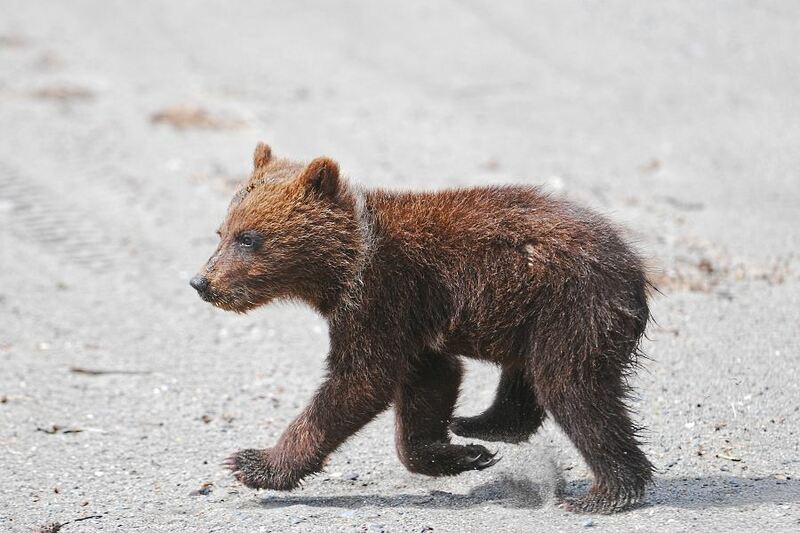 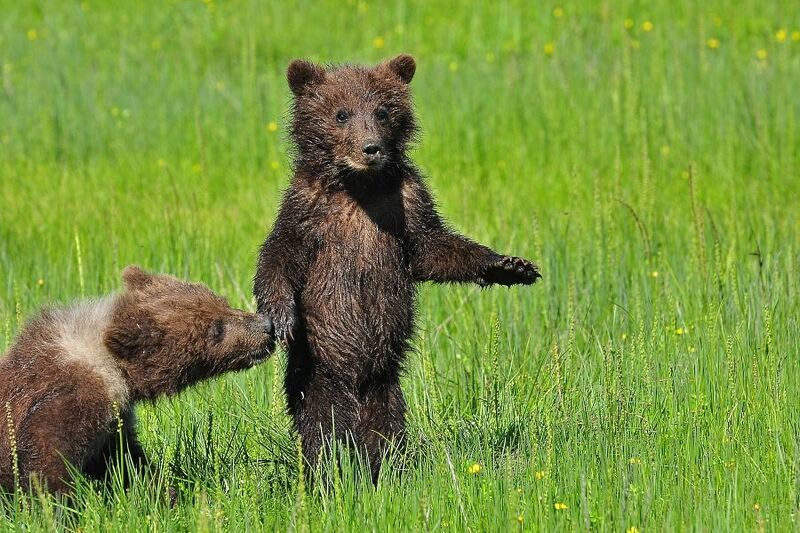 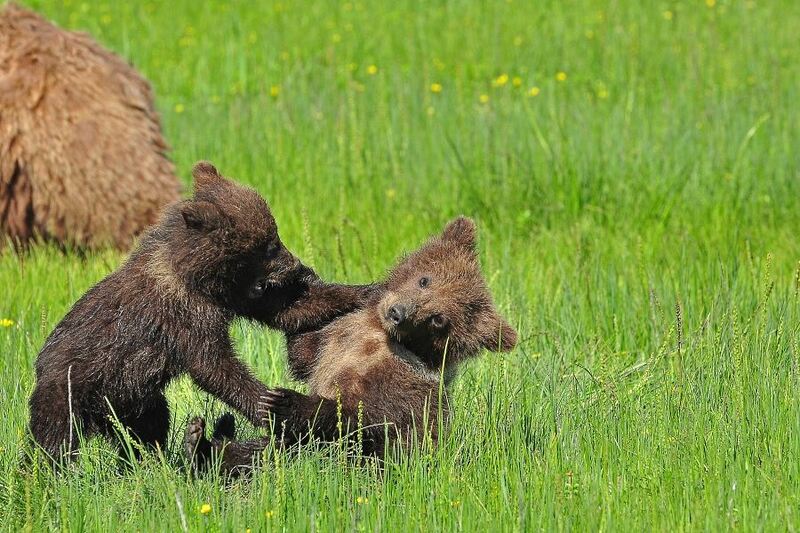 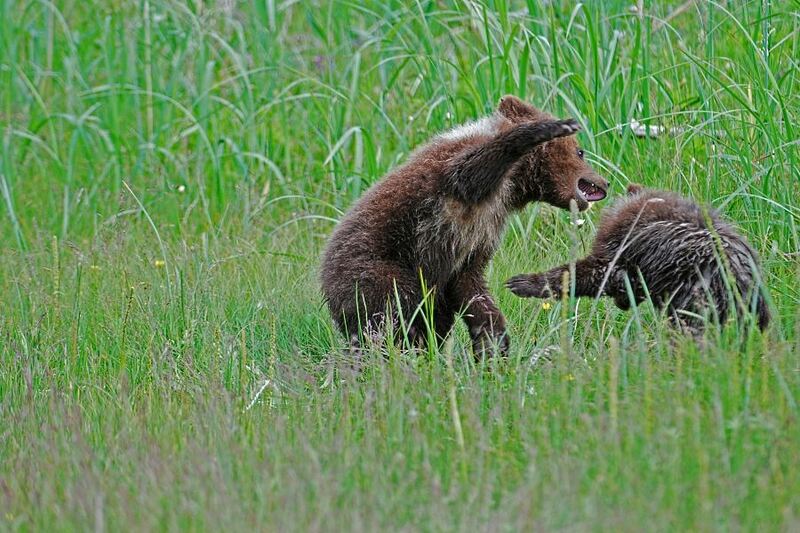 Bears are continuously on the lookout for other bears, and mothers with cubs are particularly on edge. 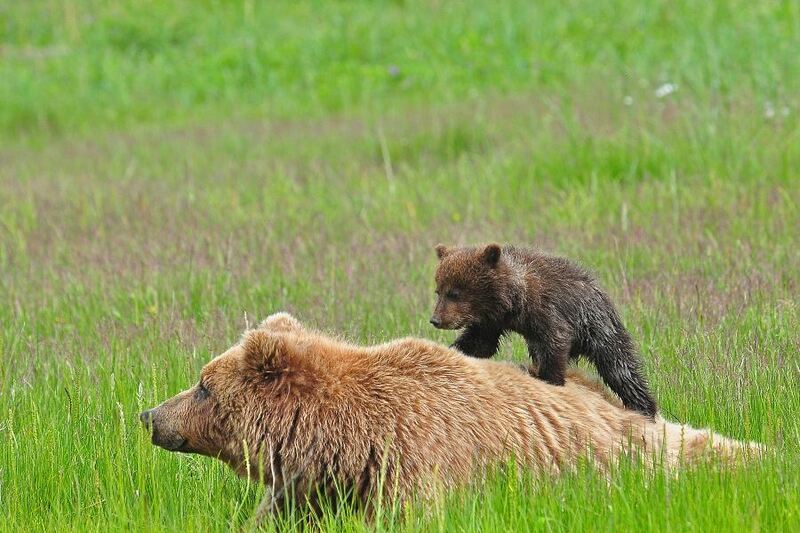 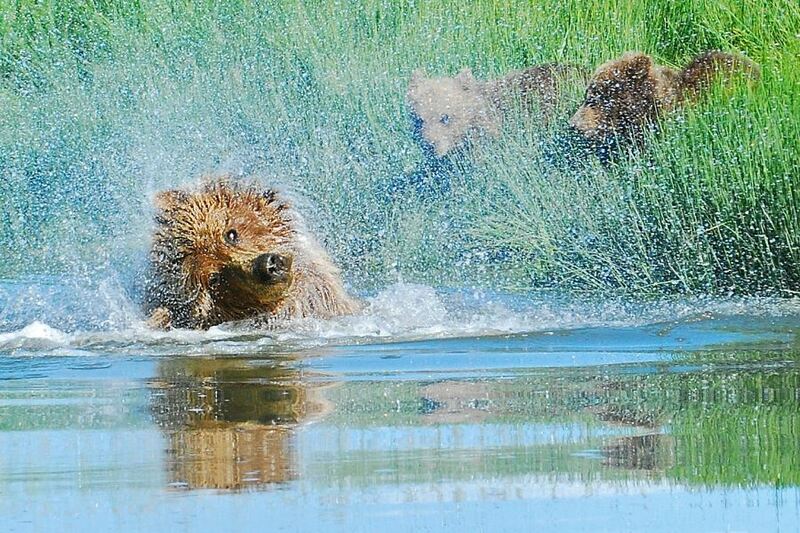 On several occasions, we saw mothers lead their cubs in a galloping retreat at the sight of an approaching bear. 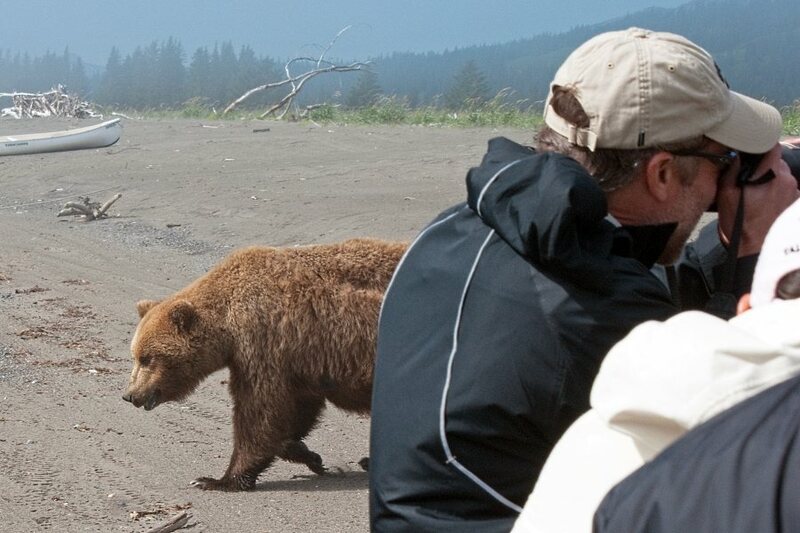 I'd like to thank our excellent guide, David Rasmus, for an amazing job of getting us into position for our photographs, and special thanks also to chef Julius for making mealtime a pleasure. 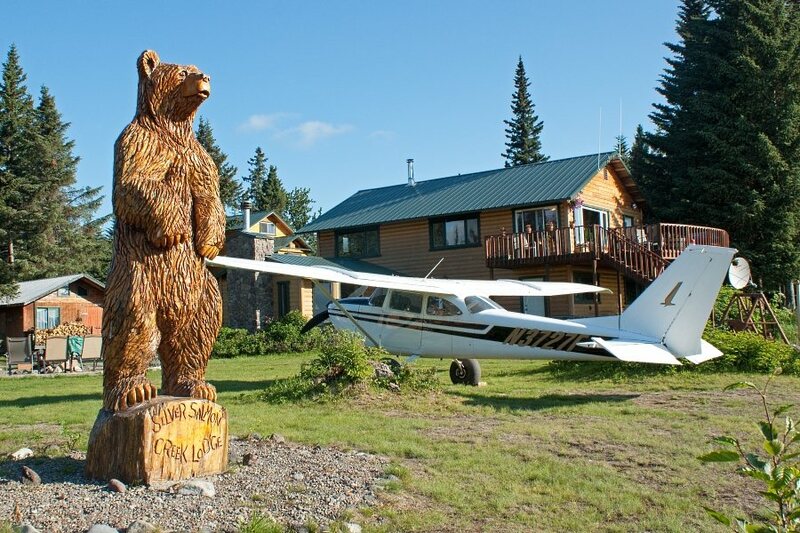 SSCL is not packaged with Alaska cruises by the cruise lines but can be booked directly through the lodge, including round-trip air by bush plane. 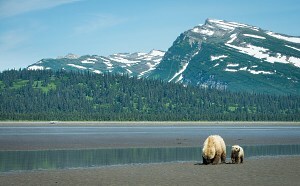 Lake Clark National Park is a slice of heaven. 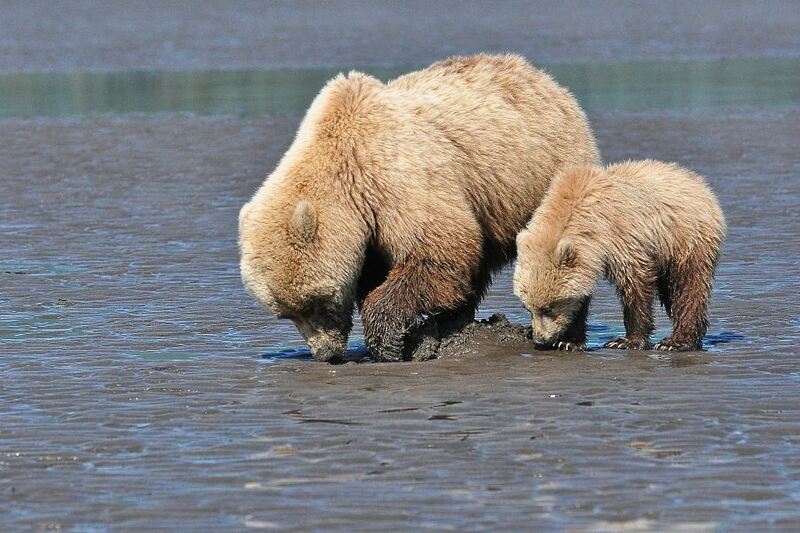 As I sit in my Houston office on a sweltering summer day, I'd almost trade places with a razor clam to be there now.